A long time, as usual these days, since the last Bird of the Moment, but I haven’t been entirely idle in the meantime. 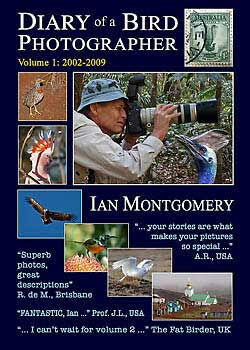 I’ve been busy both revising the ebook, Where to Find Birds in North-east Queensland, and compiling a second volume of birds of the week/moment covering 2010 until the present. 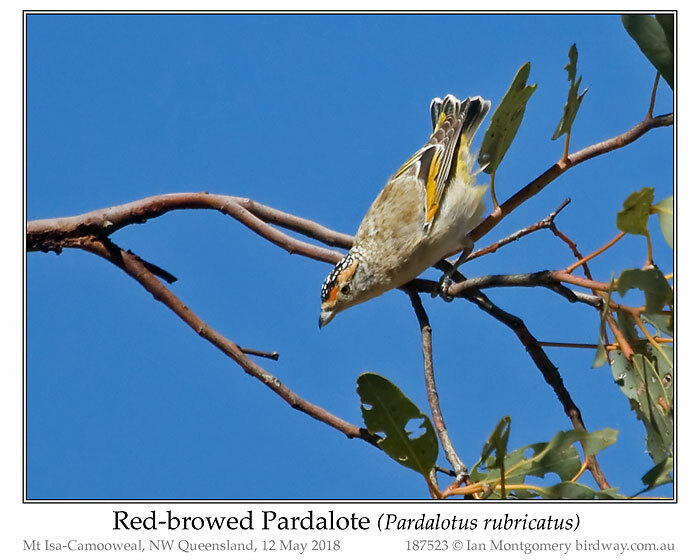 More about those in a minute, but here is the Red-browed Pardalote, a species I wanted to photograph for Where to Find Birds in North-east Queensland and which I mentioned in the previous two Birds of the Moment, the Masked Finch and the Black-breasted Buzzard. 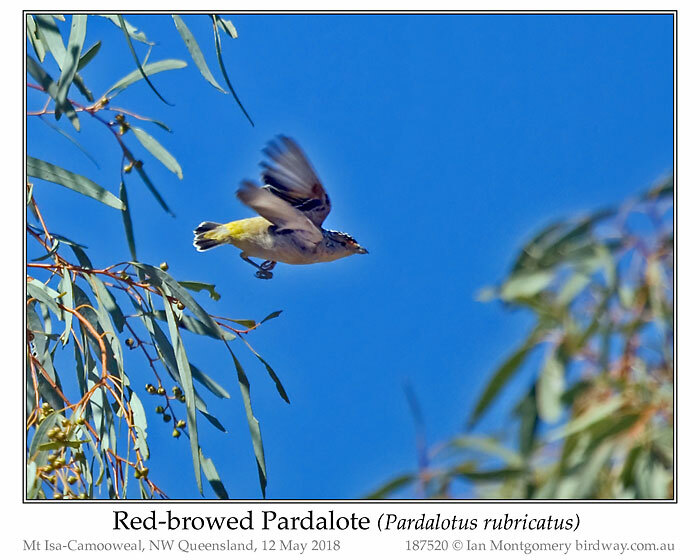 I finally tracked it down at McNamara’s Road between Mt Isa and Camooweal with the help of my Mt Isa birding pal Rex Whitehead and another Mt Isa birder Karen who took me to a couple of spots on this road where they had found the Pardalote shortly before. 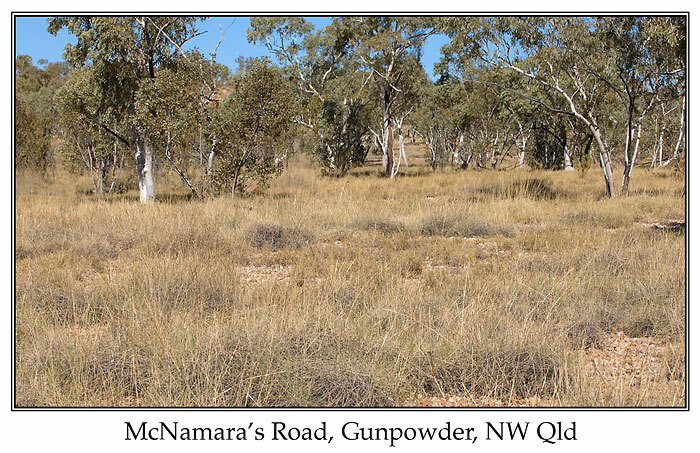 McNamara’s Road, about 68km from Mt Isa on the Barkly Highway going towards Camooweal is a famous site for the Carpentarian Grasswren though I have spent many hours there on a number of occasions, including this one, without finding any. We had more success with the Red-browed Pardalote helped by the fact that the dominant tree here the Snappy Gum doesn’t get very tall so when you hear the characteristic call of the bird, a mellow rising, accelerating piping of five or six notes, you know that they aren’t too far above the ground. 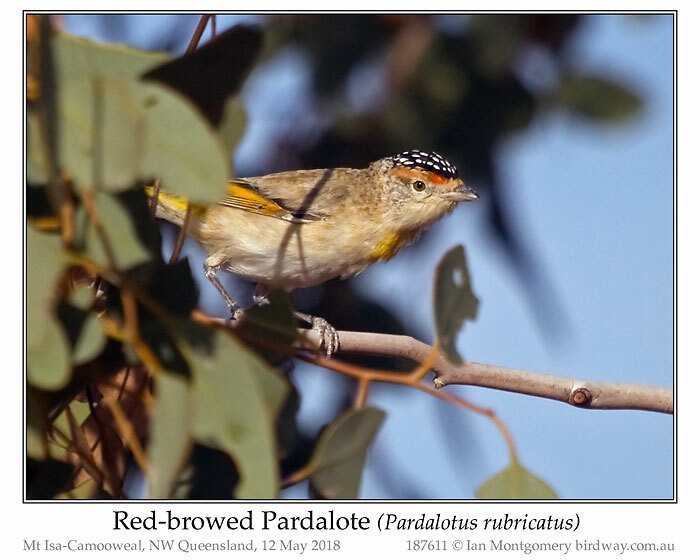 It has, for a Pardalote, a large, rather chunky bill, second photo, and the white spots on the black cap distinguish it from the local race of the Striated Pardalote (uropygialis). It has distinctive mustard-coloured wing bars and in flight, third photo, shows a yellowish-green rump. Back to ebooks. 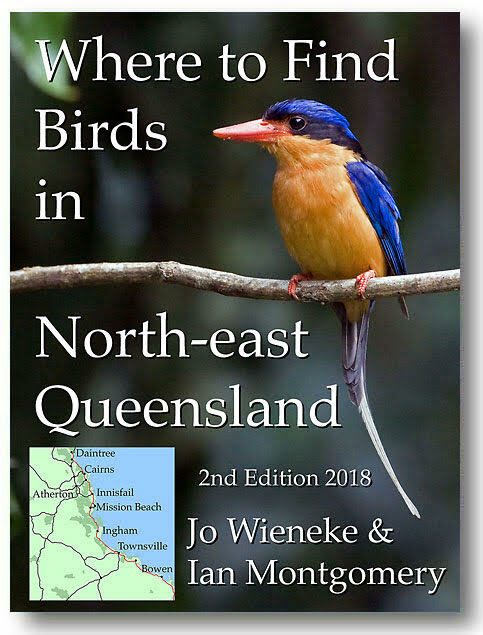 The second edition of Where to Find Birds in North-east Queensland has gone through a number of iterations and refinements since I first put it up on the website in August of this year, and the latest version went up yesterday both in epub and pdf formats. This is a free update to owners of the first edition but to access it you need a Dropbox link to the folder. If you bought it since January 2017, you should receive a separate email with a link to the folder. If you don’t receive this email, perhaps because your email address has changed, let me know: mailto:ian@birdway.com.au. If you purchased it prior to January 2017, you would have done so through Apple, Google or Kobo and I won’t have your email address. So write to me and I’ll send you the link: mailto:ian@birdway.com.au. Ian’s Birds of the Moment always come as a surprise. When he was doing them weekly, they were part of the scheduled post here. So, now that he surprises us, and thankfully he does, we will just double them up with what else has posted that day. 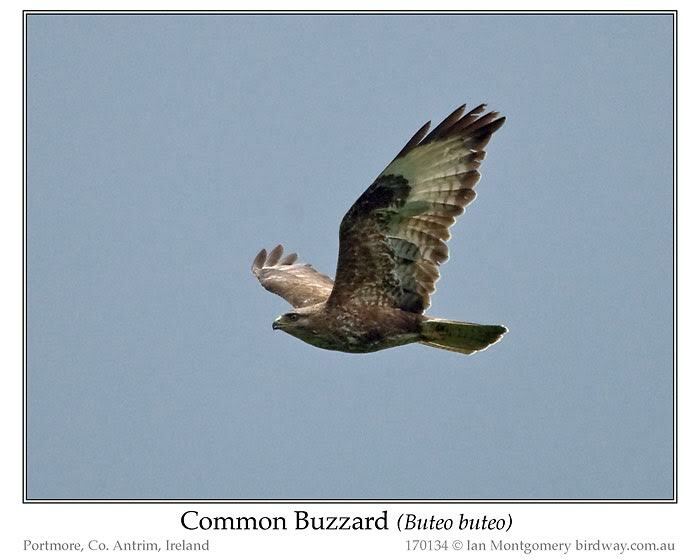 Surprise, surprise – another bird of the moment at last. 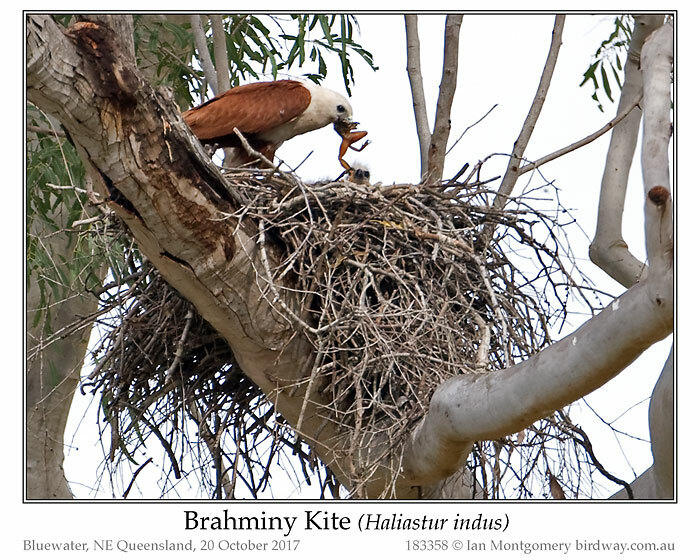 The Brahminy Kite last featured as bird of the week in August 2003. In those days you got a single photo and a short paragraph of text, so here is a more thorough treatment. 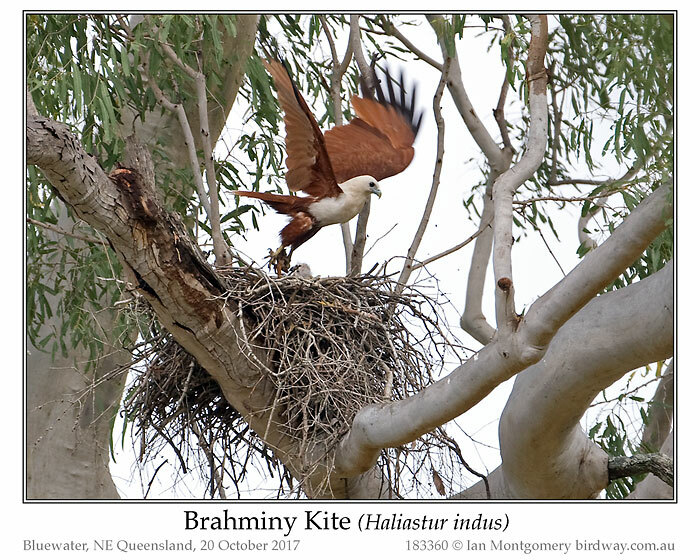 This is one of my favourite Australian raptors and the adults are striking looking birds with their white and chestnut plumage. 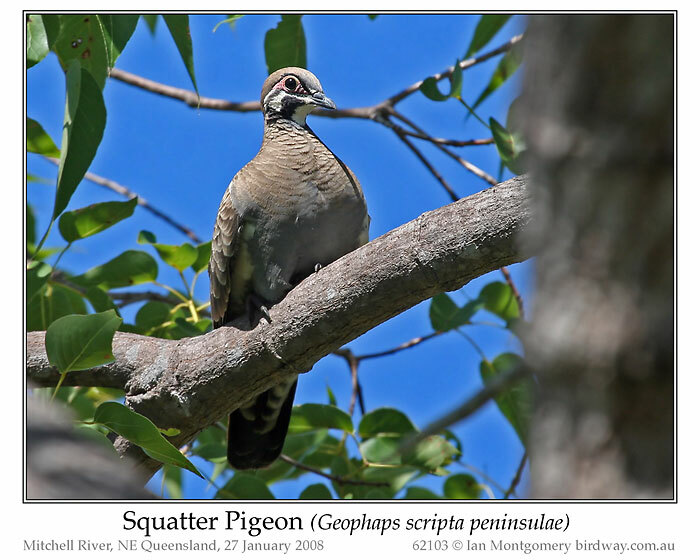 They’re a common sight along the coast here in North Queensland, and the bird in the first two photos was photographed at Toomulla Beach, about 40km northwest of Townsville and not far from where I live in Bluewater. 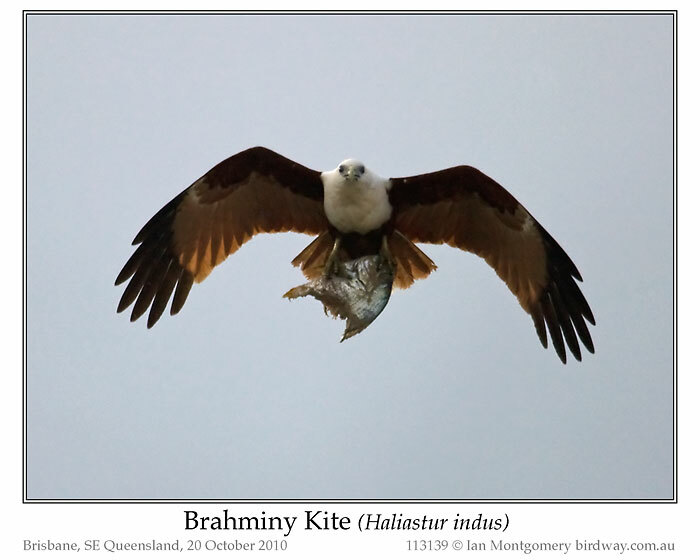 The hooked beak is like that of the White-bellied Sea-Eagle, so it’s no surprise that they are adapted to eating fish, for which they both hunt and scavenge and are usually found near water, mainly coastal but also along larger rivers. They have, however, very broad tastes and will eat any flesh that they can catch or find, both vertebrate and invertebrate. It’s not unusual to see them cruising main roads looking for road-kill. With a length of about 50cm/20in and a wingspan of 1.2m/47in , they’re much smaller than sea-eagles (80cm/31in and 1.8-2.2m/71-87in), but their preferred habitat and diet means that they’re are often called sea-eagles by the general population. 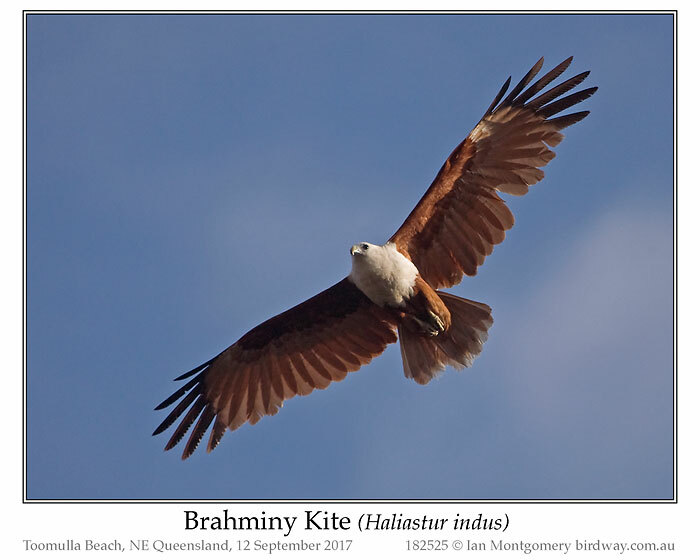 The names “Brahminy” and Haliastur indus give a clue as to their geographical range, as they were first described in India. Their range extends from Pakistan in the west through south and southwest Asia to eastern China and Taiwan, and south through the Philippines, Malaysia and Indonesia to New Guinea and Australia. In Australia its range is mainly tropical from Carnarvon in Western Australia across northern Australia and down the east coast as far as about Myall Lakes in New South Wales, though it is uncommon south of Cape Byron. Its population in New South Wales contracted northwards owing to the use of persistent organochloride insecticides in the third quarter of the 20th century, but there is some evidence of recovery since then. 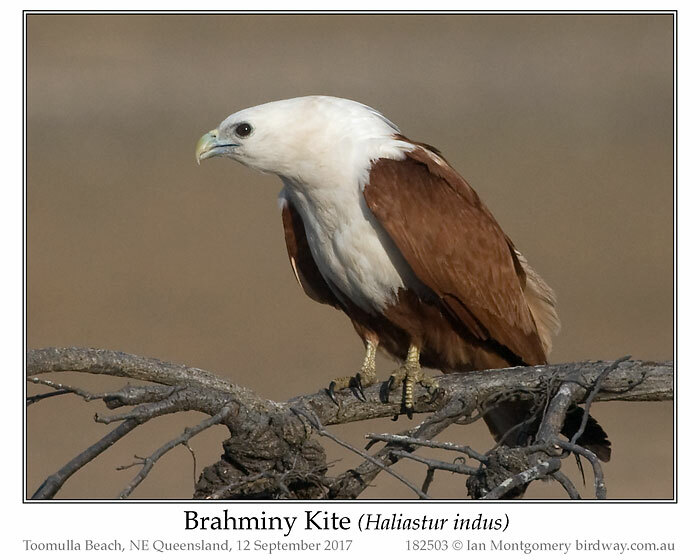 Immature birds differ greatly in appearance from the adults, third photo, and are easily confused with other raptors such as, in Australia, pale phase Little Eagles or immature Black-breasted Buzzards. 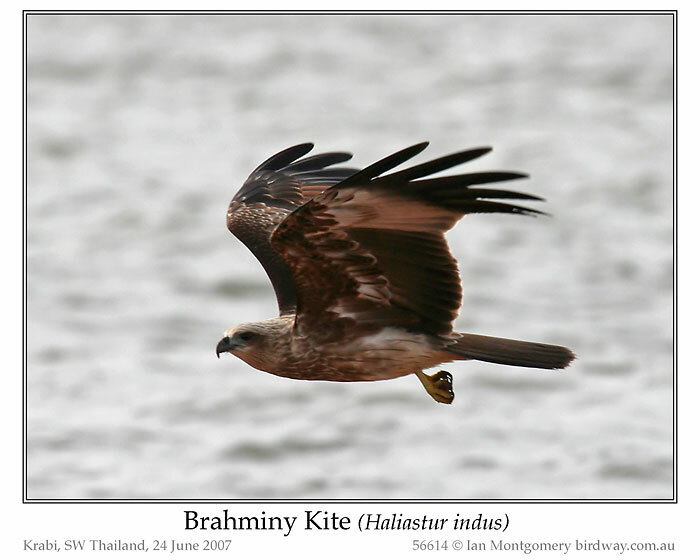 Immature birds are also rather similar to their only close relative the Whistling Kite (Haliastur sphenurus), though Brahminy Kites have much shorter, rather eagle-like tails and shorter wings. You may remember that I visited Slovakia in June 2016 with my sister Gillian. The main birding target was eagles, but despite the best efforts of our guides we had only limited success with such species as Lesser Spotted Eagle Eastern Imperial Eagle and Golden Eagle, and the local raptors didn’t seem at all keen on having their photos taken. 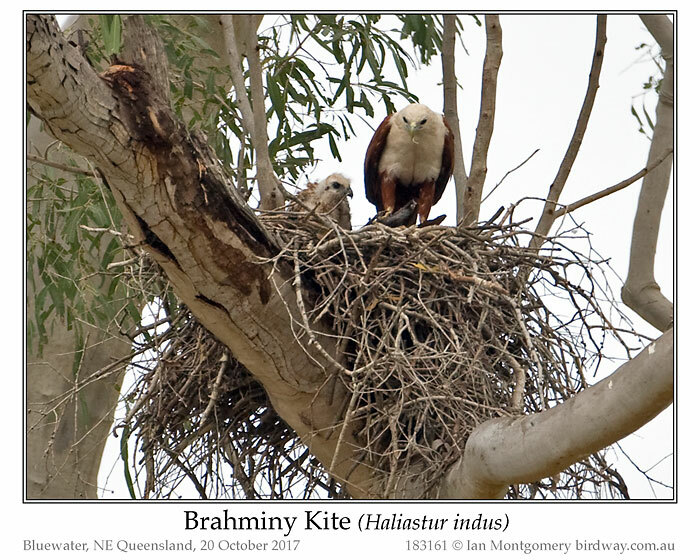 So, there was a certain irony when I returned to Bluewater and found that my excellent house minders, Julie and Ed, had discovered a pair of Brahminy Kites nesting in my neighbour’s property, about 100m from my house (fifth photo). The grass is greener, etc. etc. The birds attended the nest for about three months but disappointingly without success. The nest was high up, about 25m/80ft from the ground, so it wasn’t possible to see into it, so I don’t know what happened. Anyway, you can understand my delight when the birds returned again this year and restored the nest, sixth photo. At the beginning of last week I finally spotted a healthy looking chick. It survived the unseasonable heavy rain we had last week (150mm/6in in five days) so I set up the camera and tripod, table, chair and coffee near the house and watched them in comfort at an unobtrusive distance for most of Friday afternoon. Sure enough, both adults arrived with food. The first, seventh photo, produced a flying fox (fruit bat), a Black Flying-fox I think, and spent an hour carefully tearing off tiny strips of muscle and feeding to the chick. I was impressed with the gentle way the parent fed the youngster and itself. Eventually, the chick seemed satisfied, and lost interest in the meal. The adult bird slipped away as quietly as it had arrived – I didn’t see it leave – and I presume it took the remains of the fruit bat with it. Within half an hour, the other adult arrived with a frog, I think a Green Tree Frog (ninth photo). This adult has whiter plumage and a longer beak than its partner, so they are not hard to distinguish. The chick seemed satiated and not very interested, so the adult hungrily ate some of the frog itself and after a little while flew off taking the frog with it and went down to nearby Bluewater Creek. 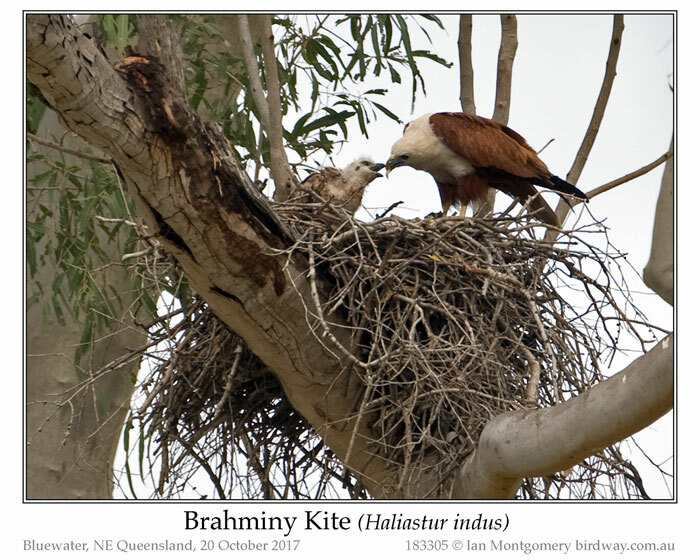 Brahminy Kites usually lay 2 or 3 eggs, and often only one chick survives to fledging. Incubation takes about 35 days, and fledging 7 to 8 weeks. The young birds remain dependent on the adults for a further two months. This chick is about half the length of the adults and is beginning to grow proper feathers, including flight feathers on the wings, though these currently appear as just short quills. I can see the nest through the trees from my back verandah, so it is easy to check on it. I plan to photograph progress over the coming weeks. A furry mammal, probably road-kill, was on the menu today. 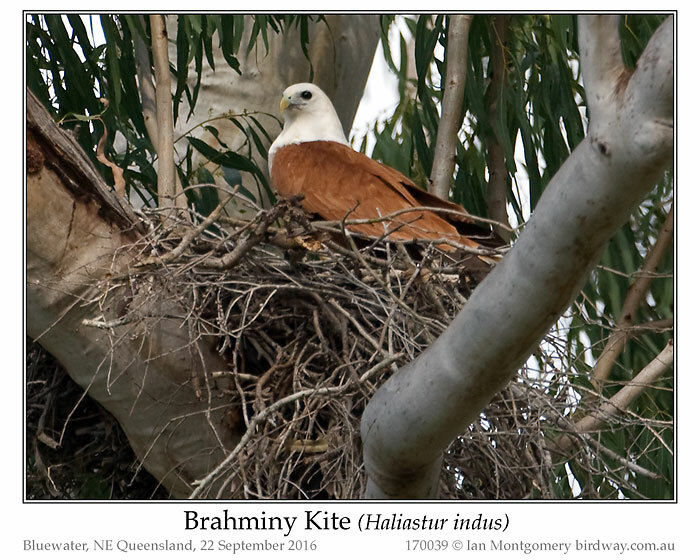 Fantastic photos of the Brahminy Kite. It sure has been a while since Ian had a “Moment” to share another of his interesting post with us. Thanks, Ian. We always enjoy seeing and learning about your birds. First of all my best wishes for a contented and healthy New Year. There is one important change for birdway customers with the new year. I’m planning to officially deregister the birdway company at the end of the Australian financial year (30 June) so in preparation for that birdway stopped trading on 31 December. I’ve registered as a sole trader, so any future invoices will be made out by me rather in the name of the company and will not include GST. I’ve also removed the books Diary of a Bird Photographer and Where to Find Birds in Northern Queensland from the Apple Store, Google Play and Kobo Books. If you want to buy them, contact me directly, ian@birdway.com.au or ianbirdway@gmail.com. 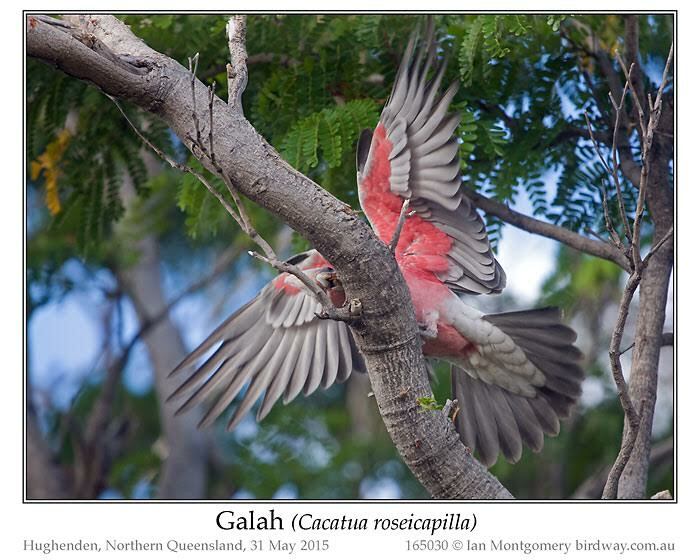 I’ve put instructions on the website: Diary of a Bird Photographer and Where to Find Birds on Northern Queensland. Having removed the middlemen and GST, I can now offer them at reduced prices of $5 and $15 respectively (Australian dollars or equivalent; foreign currencies preferably through PayPal). I’ll investigate direct purchase through the website, but for the moment I’ll email them to customers in the required format (ePub for Apple, Windows and Android computers, tablets and smart phones; Kindle for Amazon readers). 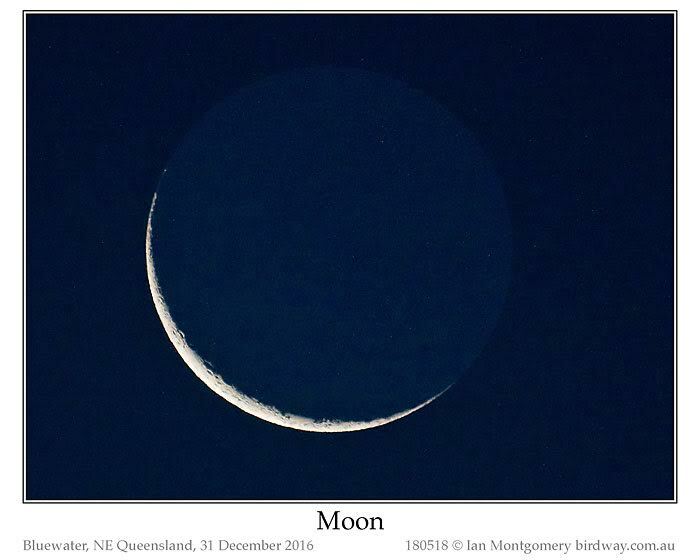 Back to the New Year: here’s the last photo that I took in 2016, a two day old new moon just after sunset on 31st December. New Year is often represented symbolically by a chubby baby wearing not much more than a top hat and a banner with the new year number on it. Here, perhaps more appropriately for us, is a new year baby Dollarbird taken from my house last Friday, 3 days after it left the nest. Junior is on the right looking relaxed, while an alert and anxious-looking parent is on the right. A pair of Dollarbirds nest regularly in a termite-ridden poplar gum near the house, which has plenty of nesting hollows thanks to the termites. The same tree is also the headquarters of the local band of Blue-winged Kookaburras, but the two species seem to co-habit quite peacefully, if not quietly. The dollarbird nest is at a great height, perhaps 25m/80ft, so the first introduction of the young birds to the outside world is a perilous decent to the ground that doesn’t always end well. This year, the young bird landed in my neighbour’s garden on the 10th January. He has both a dog and a ride-on lawn mower that is his favourite toy and I warned him about the bird. 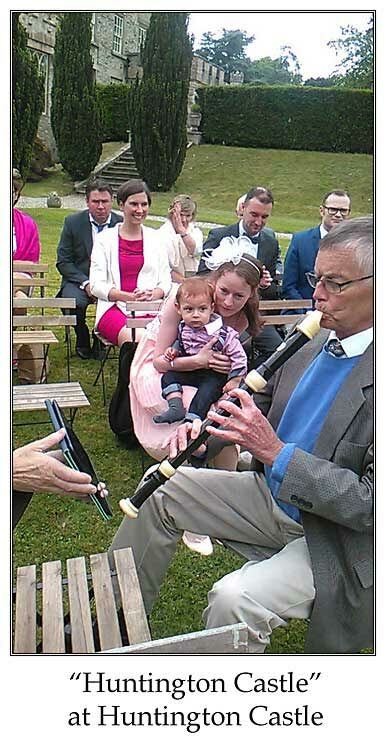 The parents made lots of noise over the next three days, presumably in defence of the newcomer. Consequently, I assumed all was well but I was of course relieved to see it safely up in the tree. That’s by way of a new year aside. 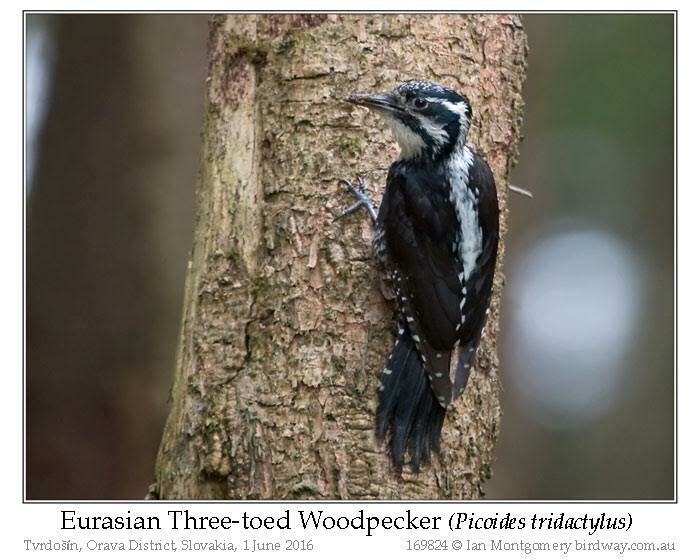 I’ve chosen another hollow-nesting bird as the subject of this posting, the Eurasian Three-toed Woodpecker from the trip to Slovakia last June. Those of you who have been on the list for a while probably know that Woodpeckers are among my favourite birds, even though or perhaps because I’ve most lived in Woodpecker-deprived countries – Ireland and then Australia, though eastern Ireland has recently been colonised successfully by the Great Spotted Woodpecker. 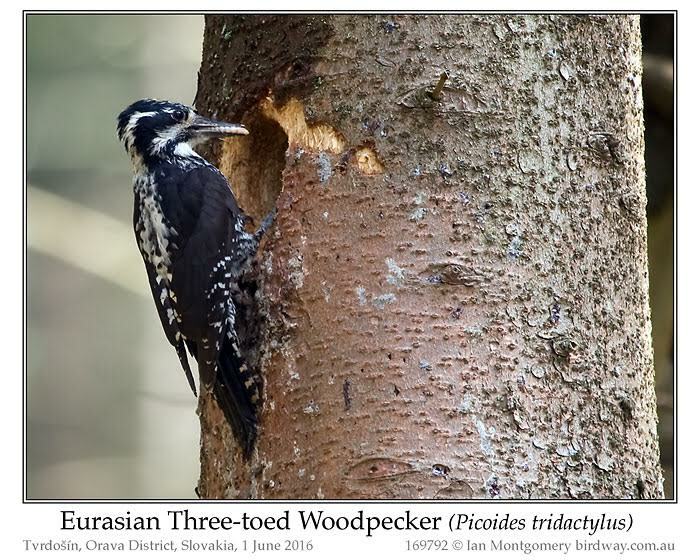 Woodpeckers were among my target birds in Slovakia. Although we saw several species, the only one that I got good photos of was this one. A very closely related three-toed woodpecker also occurs in North America. There is disagreement as to whether they should be treated as the same or separate species, so it’s qualified here with ‘Eurasian’. The nesting hollow was close to the ground so I was able to set up the camera and tripod at a convenient distance (see second last photo) and wait for the adults to visit carrying food. The males are distinguishable by having some yellow streaks on the crown. The yellow varies in intensity and was very pale in this male – first of the Woodpecker photos. He made only one visit during the hour or so I was there, so the female either did most of the work or had more success in finding food. This species is supposedly shy, but this pair didn’t take much notice of me, though the female sometimes perched on a tree closer to the camera and looked in my direction (photo directly above). A little later, our guides found an active hollow of a Great Spotted Woodpecker with noisy young nearby. These adults were much shyer and wouldn’t approach the nest while I was in the vicinity, so I left them in peace after a little while. Unlike Dollarbirds, Woodpeckers can’t rely on termites to do all the work of burrowing for them and have to do it themselves. You can see on these photos that there were a few false starts chipping through the bark. 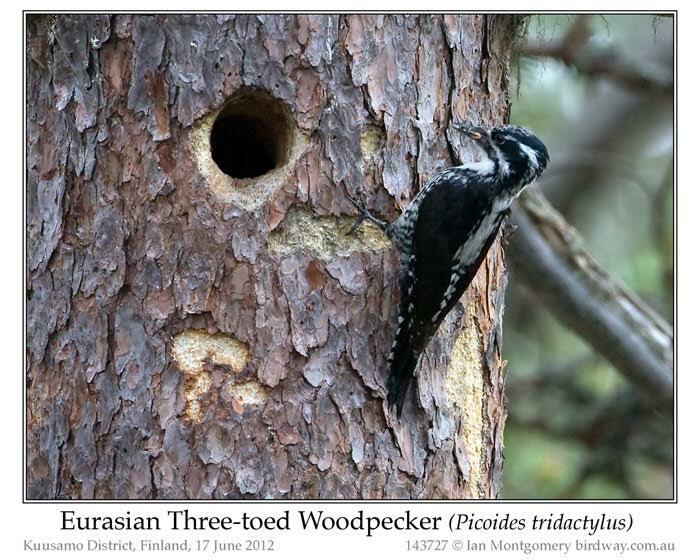 Eurasian Three-toed Woodpeckers usually nest in Spruce. 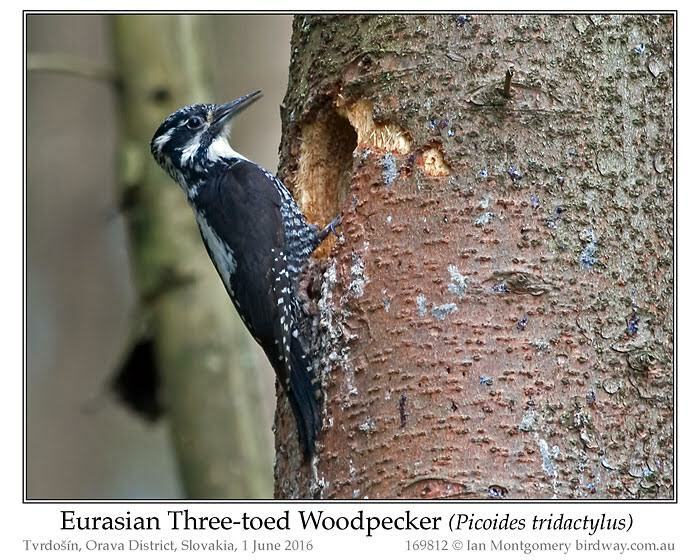 I was pleased with the photos that I got of the Slovakian Three-toed Woodpeckers. It was only later that I found that I had already photographed another nesting site in Finland, four years before (last photo). On this photo you can see that the bird has only three toes. All – I believe – other Woodpeckers have four toes and usually cling onto trees with two toes pointing forwards and two braced backwards. I find it hard to imagine what competitive advantage there would lead to the three-toed losing one of its toes. 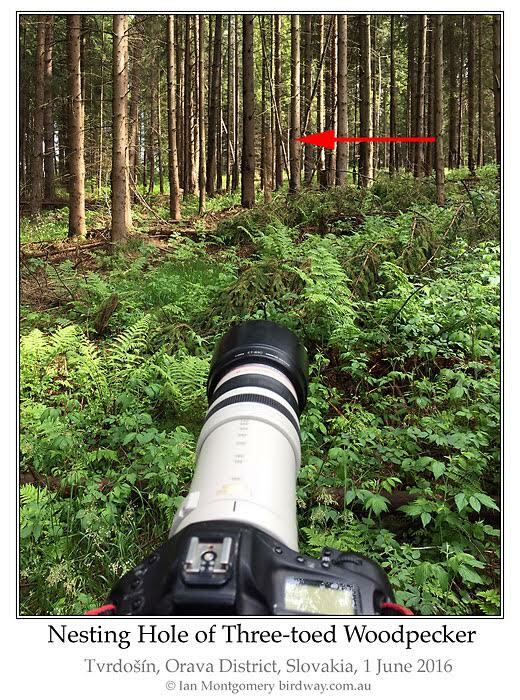 What an interesting Woodpecker and what a distance that camera is from the little avian wonder. Wow! Some birds are very obvious choices for bird of the week because they are beautiful and popular. Ironically, I can overlook them for exactly that reason as I assume they’ve featured previously. 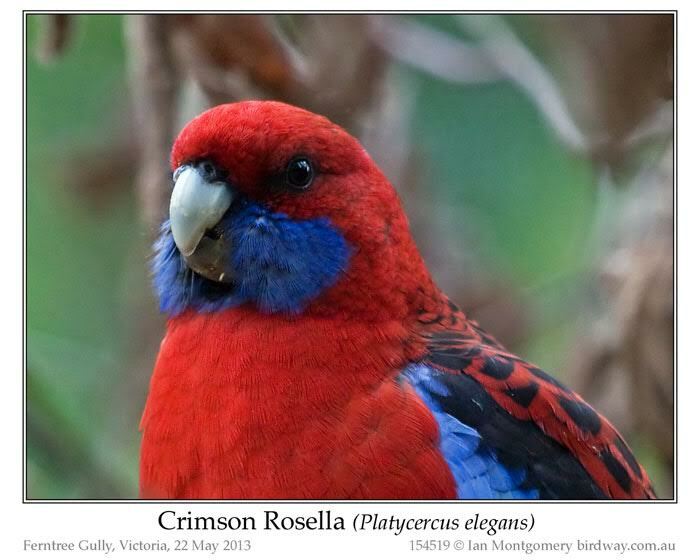 Here is one such, the Crimson Rosella, an iconic and popular bird of the forests of eastern and southeastern Australia. Normally rather shy in its natural habitat and can become quite tame in parks and gardens. It’s popularity is reflected in the fact that it has been introduced to New Zealand and Norfolk Island and (unsuccessfully) to Lord Howe Island. It nests in tree hollows and is regarded by conservationists as a pest on Norfolk Island as it competes with the smaller, endangered Norfolk Parakeet for nest sites. It feeds mainly on the seeds and fruit of trees and will forage on the ground for the grass seed, like the bird in the third photo. 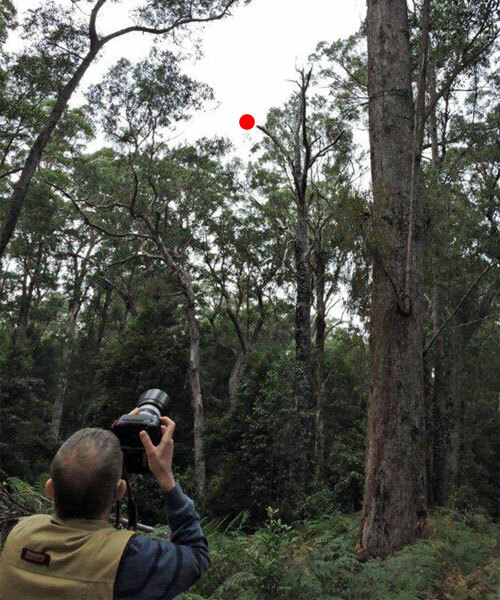 It’s a very vocal species and its ringing calls are a characteristic sound of forests in eastern Australia. Out of the breeding season, it is found in small flocks but it is territorial when breeding and the pair bond is though to persist for several years or longer. Juvenile birds of the eastern nominate race are mainly olive green with blue cheeks and patches of red on the head, breast and undertail-coverts. The nominate race extends from Cooroy in Southeastern Queensland to about Kingston in eastern South Australia. Farther north, an isolated population of the race nigrescens (‘blackish’) occurs from Eungella near Mackay north to the Atherton Tableland. This is smaller and darker than the nominate race, fifth photo, and is mainly a bird of highland rainforest. 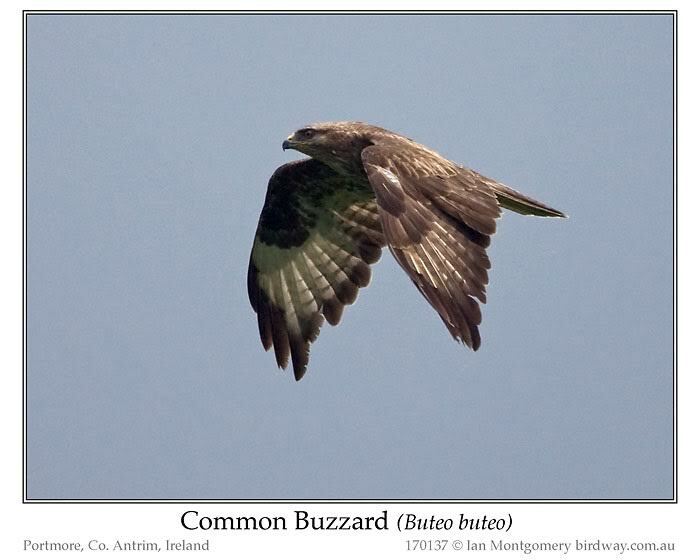 Juveniles of this northern race are much more like the adults than their southern relatives and have brownish-black feathers on the back instead of green (sixth photo). 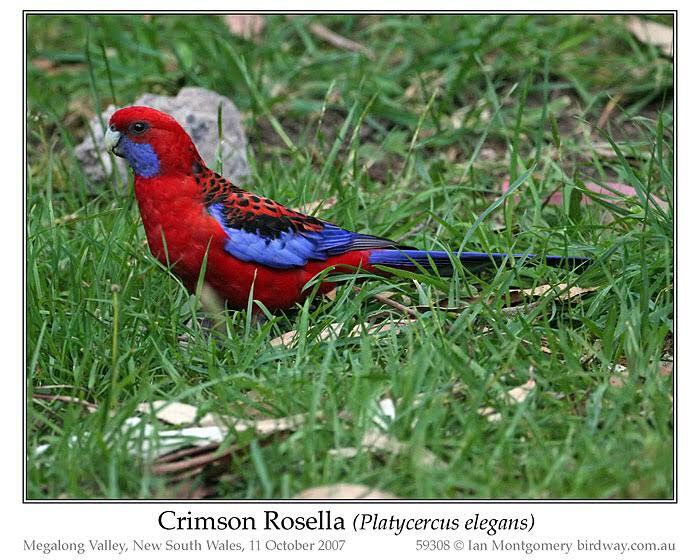 In southeastern Australia the populations of blue-cheeked Rosellas look very different and were for a long time treated as two different species, the Yellow Rosella, seventh photo, of the river systems of southern New South Wales and northern Victoria, and the orange-plumaged Adelaide Rosella of South Australia from the Flinders Ranges in the north to the Fleurieu Peninsula south of Adelaide (no photo). Yellow and Adelaide Rosellas interbreed where their ranges meet along the Murray River in South Australia. 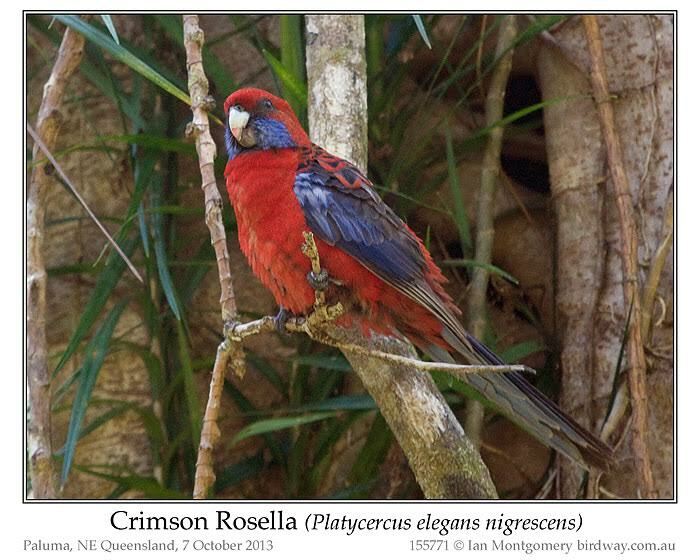 The two are now treated as races of the Crimson Rosella, flaveolus and adelaidae respectively. 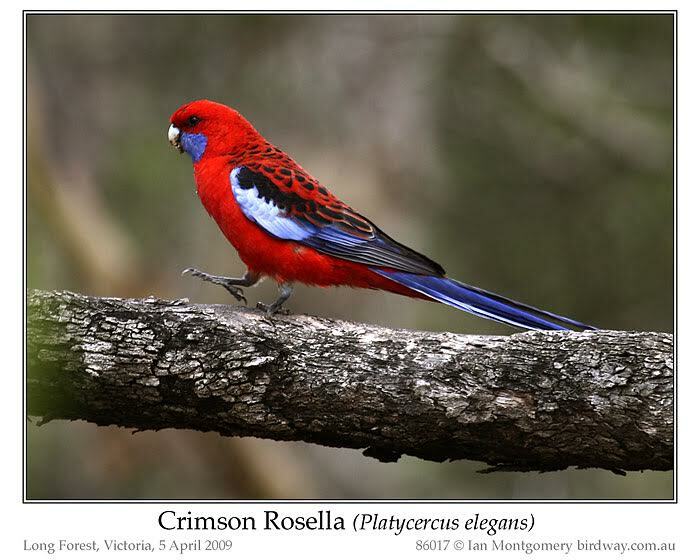 The Yellow Rosella looks very like the other blue-cheeked Rosella, the Green Rosella of Tasmania. It is, however, retained as a separate species. 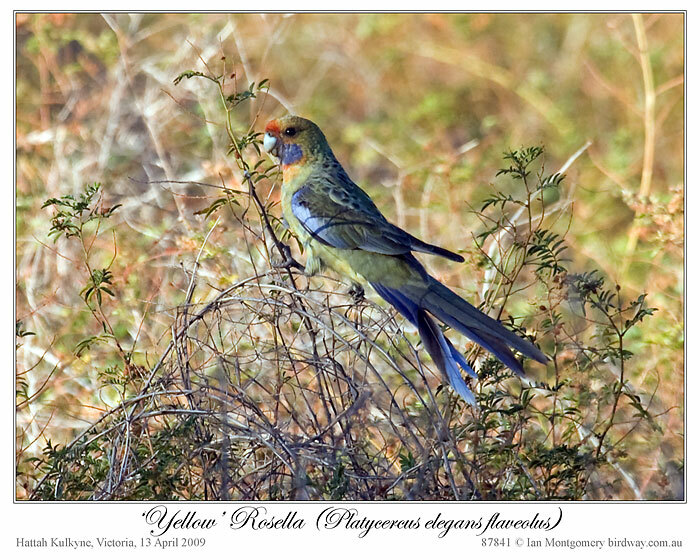 I included this photo of the Yellow Rosella when the Green Rosella was bird of the week in March 2013. 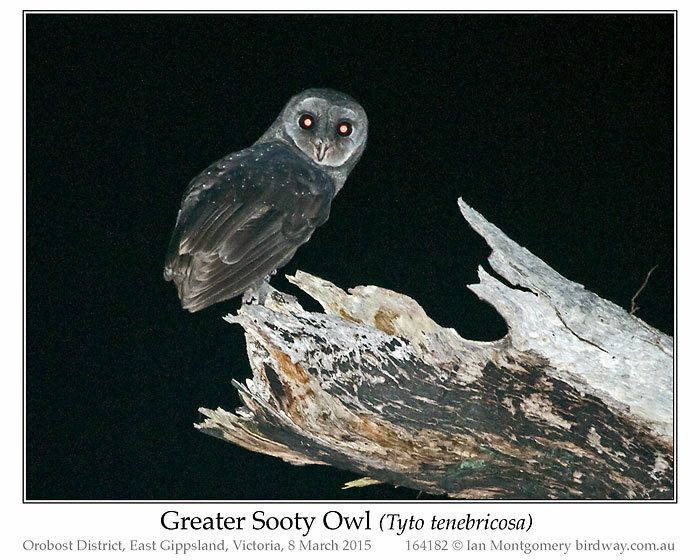 You may remember that in March of this year Greater Sooty Owl featured as Bird of the Week when I visited East Gippsland east of Melbourne with my Victorian birding pals Barb, Jen and Joy. Last Thursday I met up with the trio again, this time at Kingfisher Park west of Cairns, Far North Queensland. The main target was, naturally, Lesser Sooty Owl , another member of the Barn Owl family and a species as elusive as its larger cousin. I’d seen one at Kingfisher Park in 2002 but hadn’t photographed it and none of the trio had seen it before. 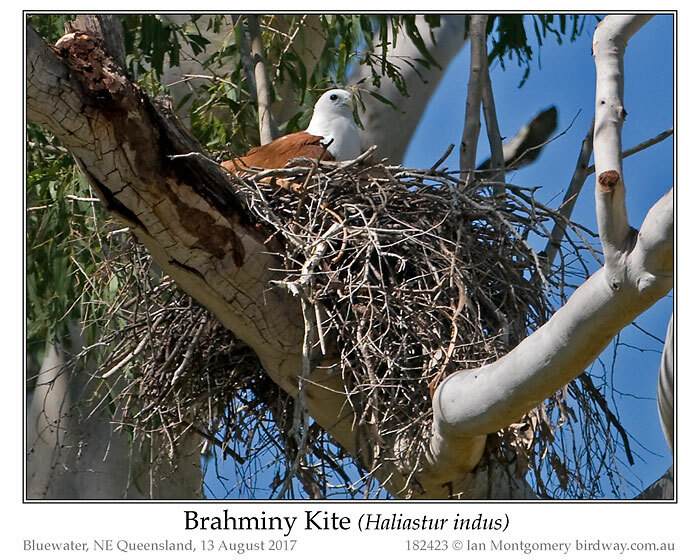 It’s a Wet Tropics endemic ranging from Paluma – and perhaps Bluewater Forest near me – in the south to Cedar Bay in the north, with an estimated population of 2000 pairs. I’ve searched for it many time since without success so I’d agree with the field guides that say: “seldom seen” (Morcombe) and “until field studies in recent decades … among our least-known birds” (Pizzey and Knight). On Wednesday night I’d searched for it along some dreadful tracks in Tumoulin Forest Reserve near Ravenshoe and on Thursday night we spotlighted the 10km length of the Mount Lewis road near Kingfisher Park with the usual result. It does occur at Kingfisher Park and Andrew Isles told us to listen for it in the evening “after the barn owls” which live in adjacent Geraghty Park. Barn and Sooty Owls make chirruping calls and both species of Sooty Owl have a characteristic descending whistle like a falling bomb. Sure enough at 6:55pm an owl chirruped maybe 50 metres from the trio’s apartment and we raced around the corner to find this bird had come to visit us and was perched in full view in a tree at a photography-friendly height. Later, I agreed with Joy that it was an OMG moment on a par with encountering the Kagu family on a forest track in New Caledonia. In the past, the Greater and Lesser have been treated as a single species, but the species split is now generally accepted. They are genetically close, but there is a big difference in sizes – Lesser 31-38cm/12-15in , Greater 37-51cm/14.5-20 (females of both are larger than the males) – and differences in appearance, call and behaviour. Their ranges are disjoint with the Greater found from near Melbourne (Strzelecki and Dandenong Ranges) along the east coast to Eungella National Park near Mackay in Central Queensland. 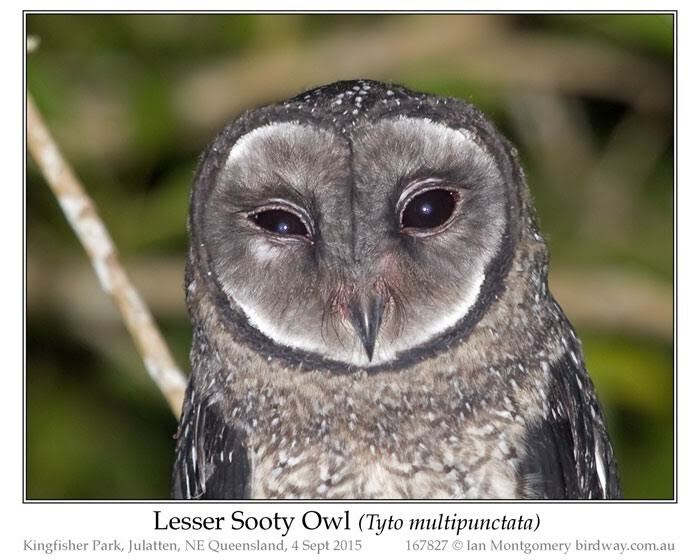 There is also a Sooty Owl in New Guinea. It’s still lumped with the Greater, which is biogeographically unlikely, but has been placed with the Lesser and may even be a different species. The behaviour of the Lesser differs in that it uses lower perches for hunting, good for photographers, and is known to cling to the side of tree trunks like the Eastern Yellow and Pale-yellow Robins. The last photo shows its impressive talons: these would be able to cling on to anything. If you’re into benchmarks, last week’s bird, the Ouvea Parakeet, was the 1500th global species on the Birday website (15% of all bird species) but the Australian total was stuck at 699 waiting for something special of course. 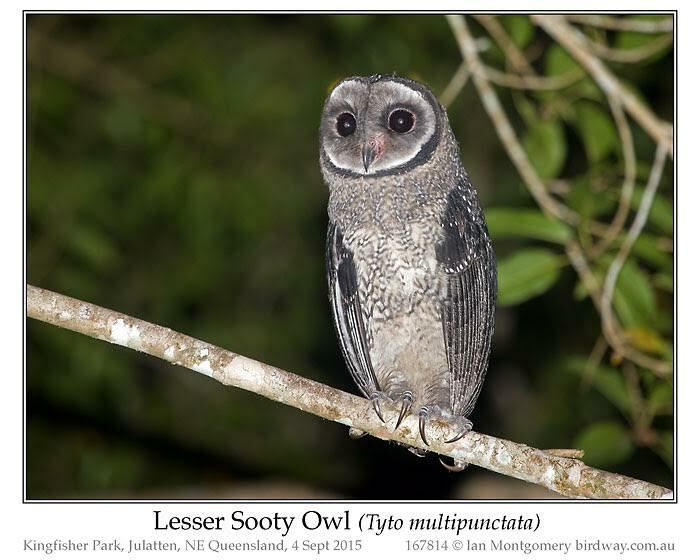 The Lesser Sooty Owl will be a fitting 700th – I haven’t put it up yet, you get to see if first – that’s 700 out of the 898 ever recorded or 78%. Happily, the remaining 940 members of the bird of the week list don’t have to wait that long for Volume 1! 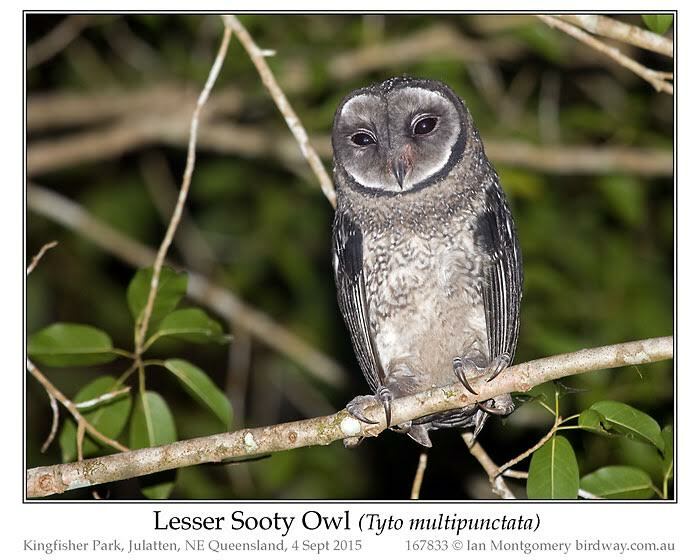 I am impressed with this neat Lesser Sooty Owl from our Creator and also with Ian’s number of Global and Australian birds he has on his birding list. Now that he is producing these books, I hope he will continue to give permission to reproduce his Bird of the Week Newsletters. I’m back home after cutting short the camping trip in Western Queensland owing to a foot problem which made both camping and walking difficult. The foot is responding well to treatment at home in preparation for the New Caledonian trip in two weeks time. So I didn’t return with lots photos of dry country species for you but I did get treated to a fine display by an extrovert male Galah who came along to distract me while I was putting up my tent in Hughenden. He wasn’t the only distractor; the camp site know-all gave me a lecture on the order in which to assemble my tent. The Galah was more welcome and I encouraged him, unlike the human, verbally. You can imagine the conversation going a bit like this. At that point the camp-site know-all came along. 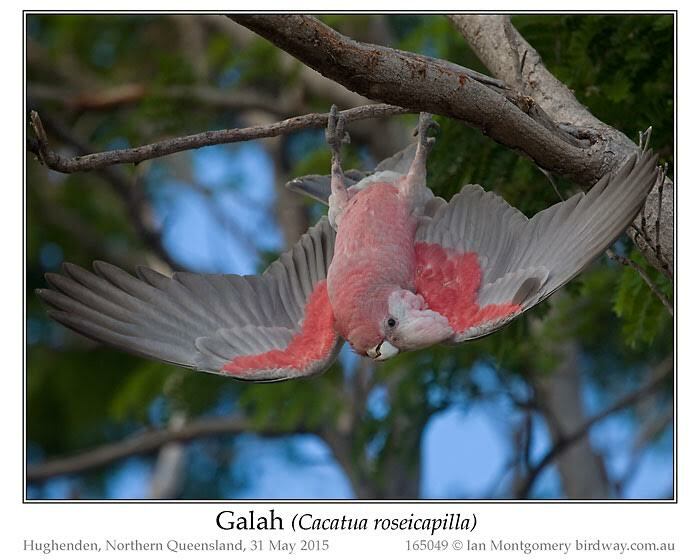 The Galah said: ‘Oh no! I’m out of here!’ and flew away. 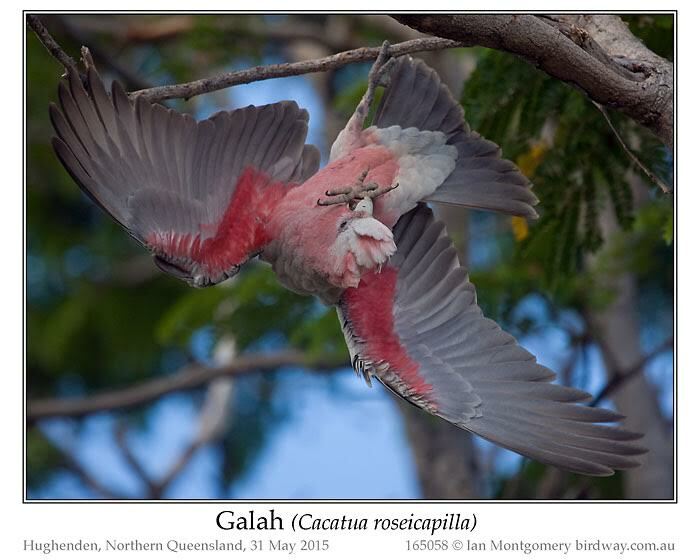 Despite their name, Galahs aren’t stupid. Just in case you are wondering why I said the bird was a male, it’s all in the eyes. Males have dark brown irises, females have red ones as in the photo above taken on a different occasion at Pentland not that far from Hugenden. This is also the case in Major Mitchell’s Cockatoo. What a delightful newsletter. Sorry about your foot though, Ian. We will be praying that you heal quickly so you can make that next trip. Who knows what adventure you will come back to tell us about? 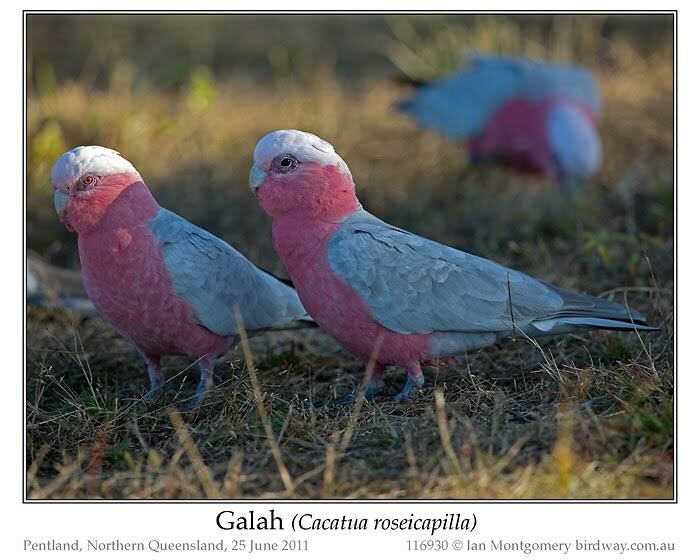 As many of my readers know, the Galah has become on of my favorite birds. 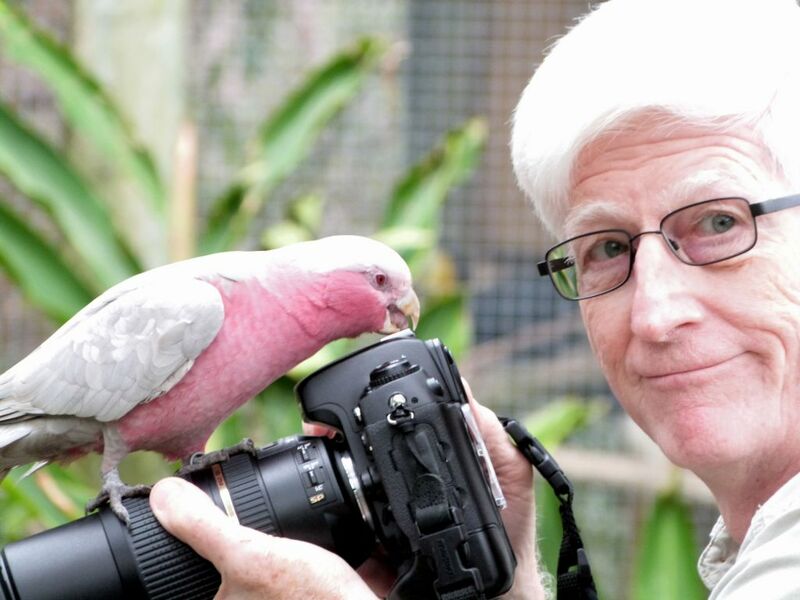 Every since our encounter with the Galah at Brevard Zoo, when this photo was taken. 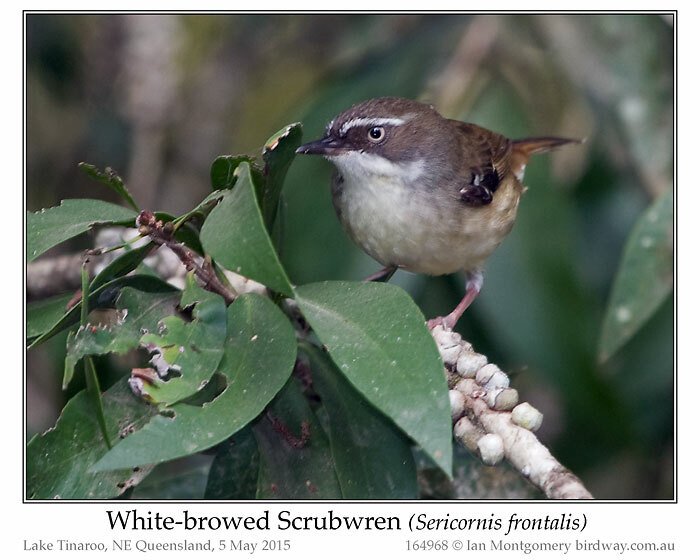 I said in the last bird of the week that the Atherton Scrubwren was ‘probably the least distinctive of the Wet Tropics Endemics’. By that I meant it was hard to identify with certainty owing to lack of distinguishing field marks and I didn’t intend to imply that it was otherwise undistinguished. I’m actually very fond of scrubwrens. They are assertive little birds with lots of character, so here is the most widespread one, the White-browed Scrubwren by way of amends! It occurs right along the coasts of eastern, southern and western Australia from Mossman – not far north of where we were at Lake Tinaburra a few weeks ago – in far north Queensland (FNQ) to just north of Carnarvon in Western Australia. The one in the first photo was in the company of the Atherton Scrubwrens near the ‘amenities’ block in the campground. 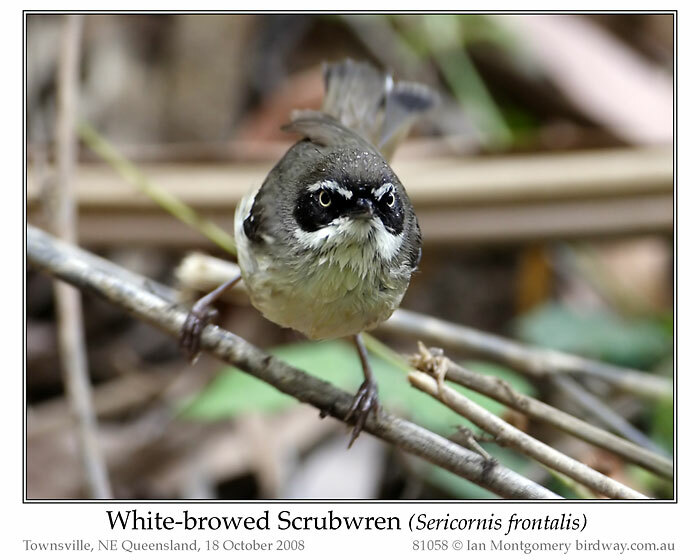 White-browed Scrubwrens vary in plumage by location and there has been considerable disagreement among avian taxonomists over the centuries over how to divide them into species and sub-species or races. 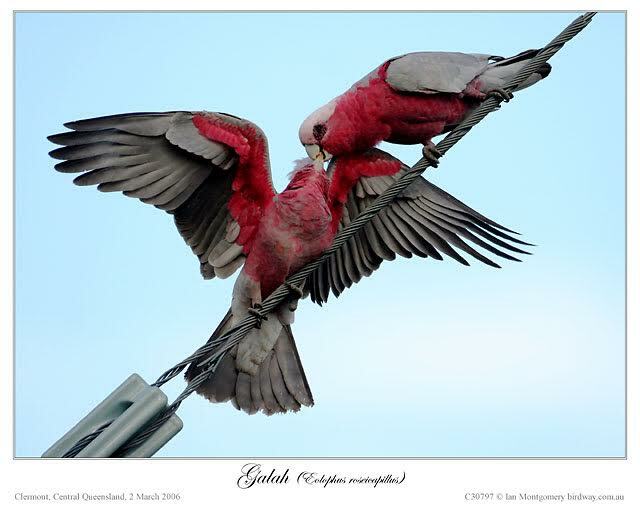 Schodde and Mason described 12 races in their authoritative Directory of Australian Birds (1999). However, the various races grade into each other and are often only distinguishable in the hand or museum. Criteria such as “feet pale flesh, drying consistently pale brownish cream, lower mandible drying variously bone to sometimes rather dusky” is not something even the most patient field worker would use. So, it’s more usual now to lump these races into 3 mainland groups and the treat the Tasmanian ones as a separate species. We’ll take a clockwise trip from Tinaburra in FNQ to Cheynes Beach in southwest Western Australia to look at these, and then come back to the Tasmanian species. 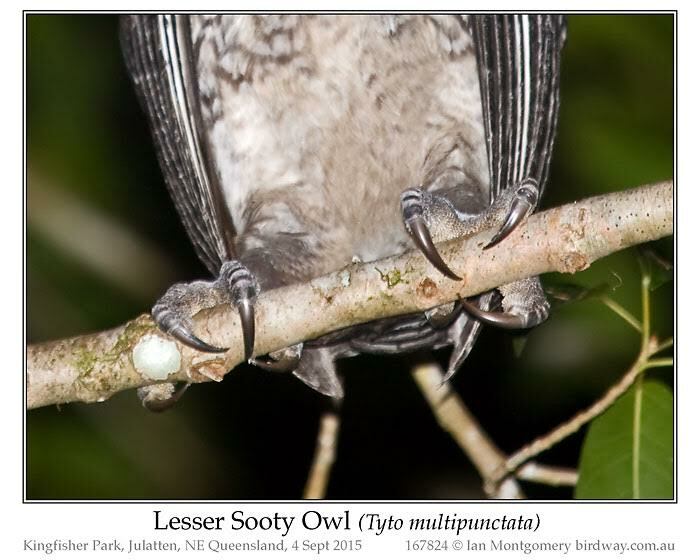 The females are paler, less-contrasty versions of the males, so we’ll just consider males, once we’ve looked at the two sexes in the distinctive Queensland race, laevigaster. The one in the first photo is a female, while the one in the second is a male. Both sexes have pale underparts that look pale yellow or buff, strong white eyebrow extending well behind the eyes and no white line just under the eye (suborbital). 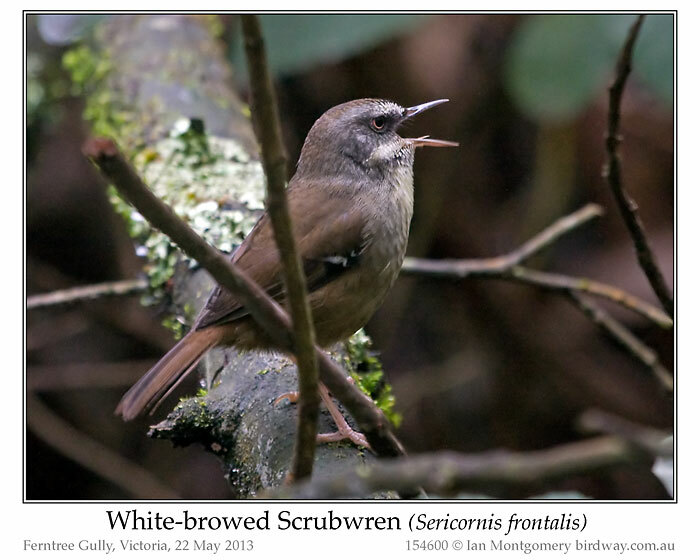 The male has a strikingly black mask extending over the ear-coverts, and is, in my opinion, the smartest of the White-browed Scrubwrens and looks somewhat like a pale Yellow-throated Scrubwren. 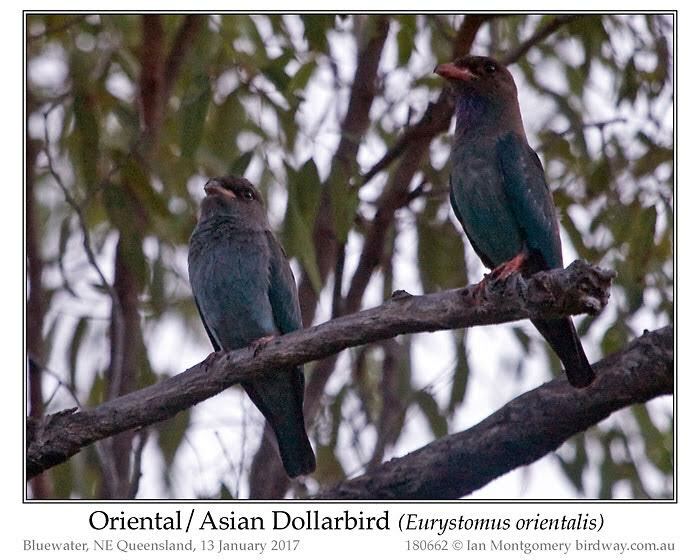 South of the Queensland border we encounter the nominate race group, frontalis. This group extends all the way through New South Wales and Victoria into eastern South Australia. The one in the third photo, taken in the Blue Mountains west of Sydney, is more rufous on the back and flanks than the Queensland race, the black on the face is limited to the lores in front of the eye (the ear coverts are grey), the eyebrow fizzles out behind the eye and the there is a faint suborbital white line. The birding singing lustily in the fourth photo near Melbourne is also of the nominate group, though it looks darker overall and has even less of an eyebrow. 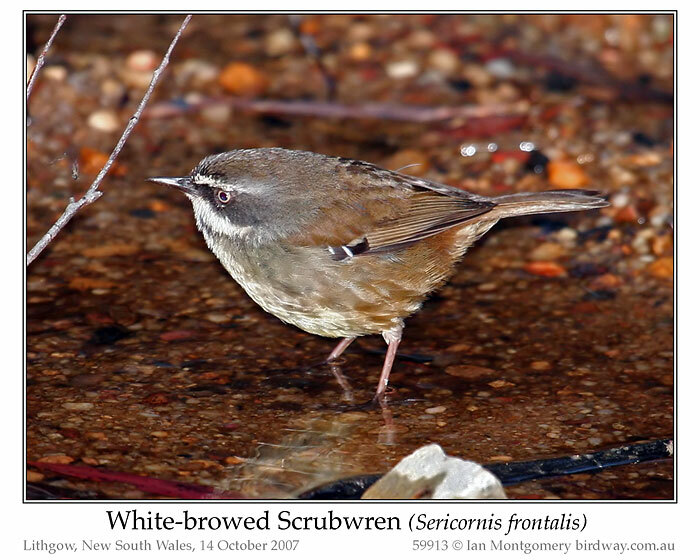 When we get to Western Australia, we encounter the ‘spotted Scrubwren’, race maculatus with dark spots on the throat and breast, buffish underparts, a long eyebrow, a clear suborbital line and, like the nominate group, the black face mask limited to in front of the eye. 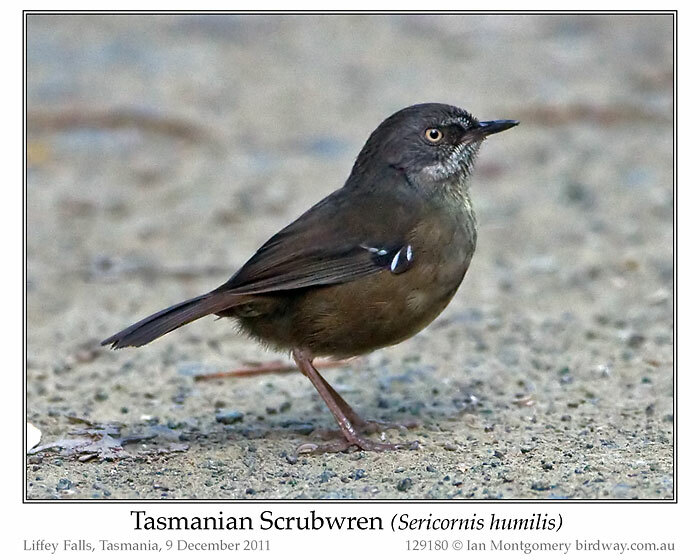 The sixth photo shows the Tasmanian one It was first described as a separate species by Gould in 1838; lumped in with the other White-browed Scrubwrens in the 20th century and now restored to the grand status of a full species in the 21st century. In taxonomy, plus ça change, plus c’est la même chose, a quote from 1849, though Jean-Baptiste Alphonse Karr probably wasn’t thinking of taxonomy at the time. He did, however, have two varieties of Dahlia and a bamboo named after him. Anyway, The Tasmanian one is very dark, though in other ways such as its faint white markings on the head it looks quite like the Victorian one in the fourth photo, though the white epaulettes are very distinct. 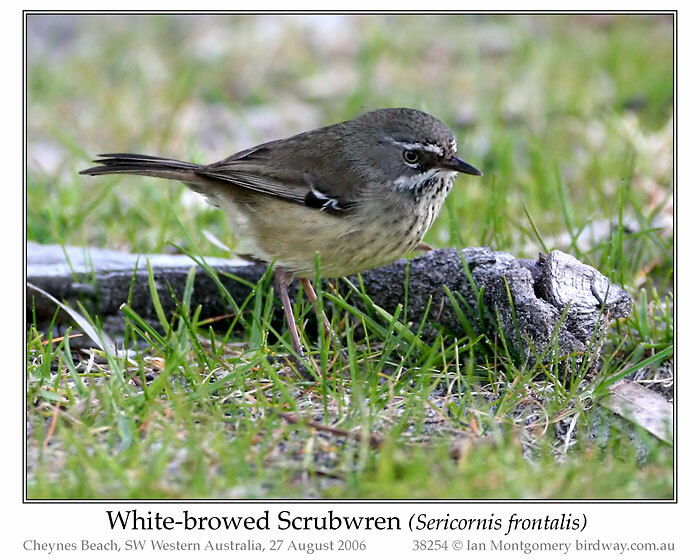 It’s also quite large by Scrubwren standards (12-14cm/4-5in in length). Scrubwrens inhabit dense undergrowth, but as long as that is provided they occur in wide variety of habitats from rainforest to scrubby heaths and are quite common. They are both vocal and curious, responding well to ‘pishing’ noises, so they are easier to find than their choice of habitat would suggest. They’re very active, foraging near the ground, often in leaf litter for insects or other invertebrates. 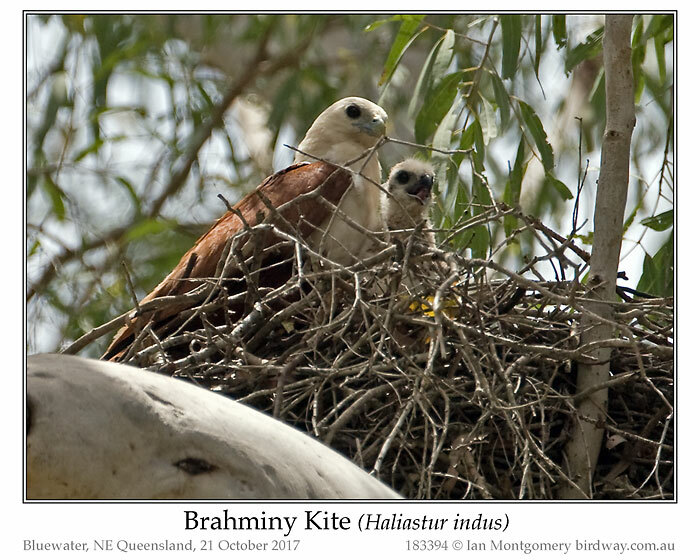 The breed in pairs or groups consisting of a breeding pair and helper birds, an arrangement that seems remarkably widespread across Australian bird families. I’m off the western Queensland on Saturday. Hopefully, I’ll have some interesting dry country birds for you but don’t expect anything for another couple of weeks. I find these Scrubwrens that Ian has been introducing very cute and interesting. Last week’s Atherton Scrubwren and now these two species are the little bird types that drive me crazy trying to photograph. Ian has a knack for getting great photos. Thanks, Ian, for sharing these with us. Happy hunting on you new quest. 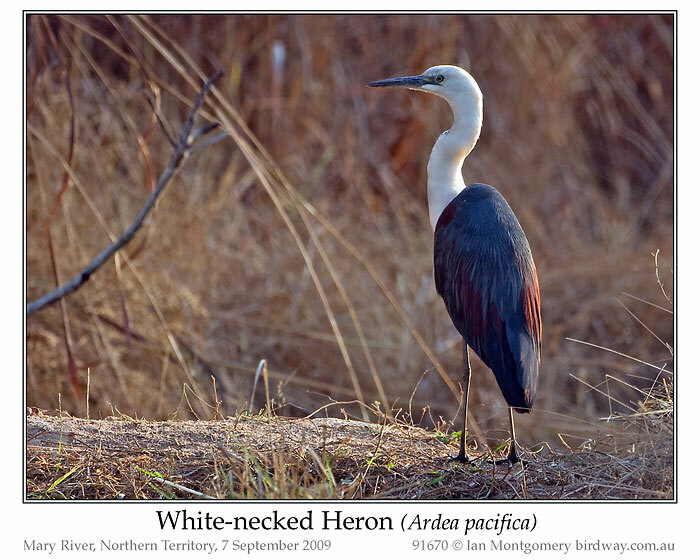 Continuing last week’s theme (White-faced Heron) of common – but in these pages neglected – Australian herons here is the other very widespread species, the White-necked or Pacific. It’s not as abundant or as well-known as the White-faced, but much bigger and a striking bird with its white head and neck and slate-grey back and wings. In length it varies from 76-106cm/30-42in with wingspan to 160cm/63in. In breeding plumage, it develops plum-coloured plumes on the back (first photo at sunrise) and shoulders (second photo at sunset). It’s predominantly a bird of freshwater and is only rarely seen in estuaries. It’s quite partial to small shallow ponds and is widespread in inland Australia when water is available, moving to more coastal areas in dry seasons. So it can turn up almost anywhere in the country. In southern Australia it breeds in Spring and Summer; in northern Australia it can breed at any time of the year depending on rainfall – the one in the second photo was photographed in mid-winter in Townsville, but the first half of 2008 was very wet in northern Australia. According to the field guides, non-breeding birds have rows of grey spots on the front of the neck, like the one in the third photo. The neck is supposedly completely white in breeding plumage, but it is not unusual to see birds with both purple plumes and grey neck spots. Both the second and third photos show the white patches on the leading edge of the wing. These are obvious (and diagnostic) in flight when they look like the landing lights of a passenger aircraft. The bird in the fourth photo was in Boulia, in far western Queensland north of Birdsville. 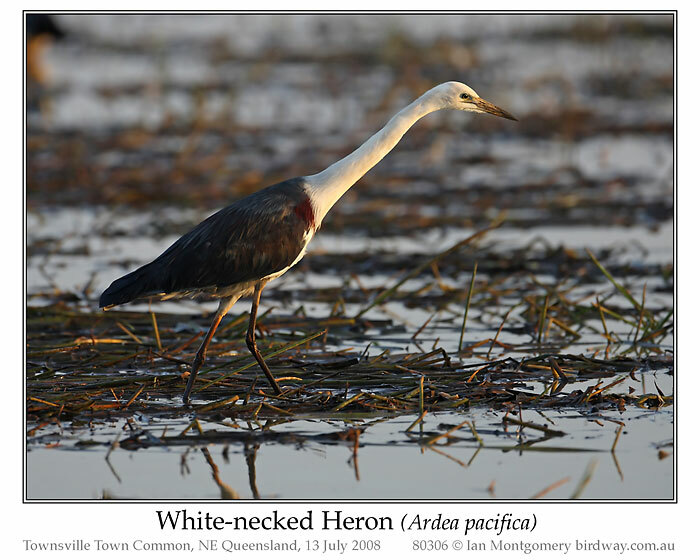 The field guides and HBW (Handbook of Birds of the World) are vague about juvenile plumage but are supposed to have more spots on the neck than non-breeding adults and may have greyish head and neck. 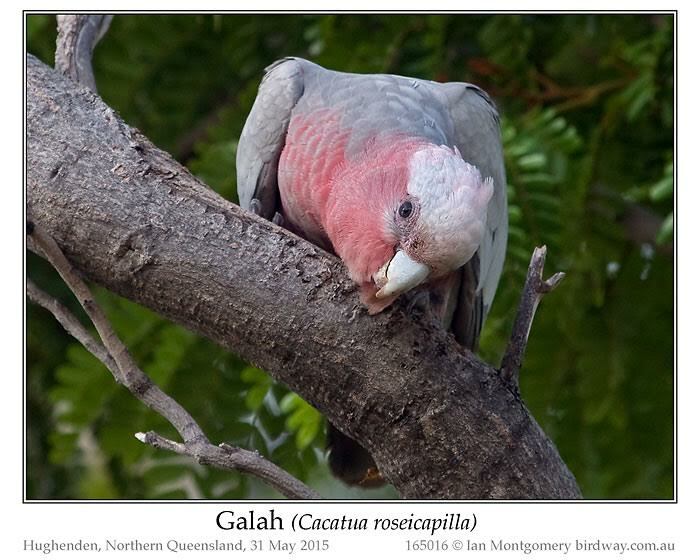 the one in the Boulia bird has a white head and neck with grey spots on the sides of the neck, while the bird in the fifth photo has a grey head and neck. I assume that both of these are juveniles. Both have pale spots on the wings, but I can’t find are reference to that in the field guides. I haven’t got HANZAB (Handbook of Australian, New Zealand and Antarctic Birds) so if anyone reading this does, I’d be grateful for any illuminating feedback on juvenile plumage. 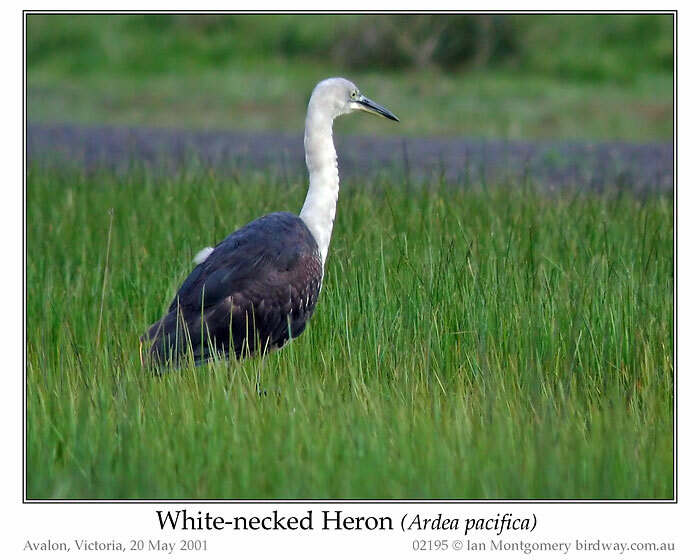 The White-necked Heron breeds only on mainland Australia. It does, however, turn up regularly in Tasmania and southern New Guinea and has been recorded as a vagrant on Norfolk Island and in New Zealand. Thanks again, Ian. I really like that reflection in that fourth photo. 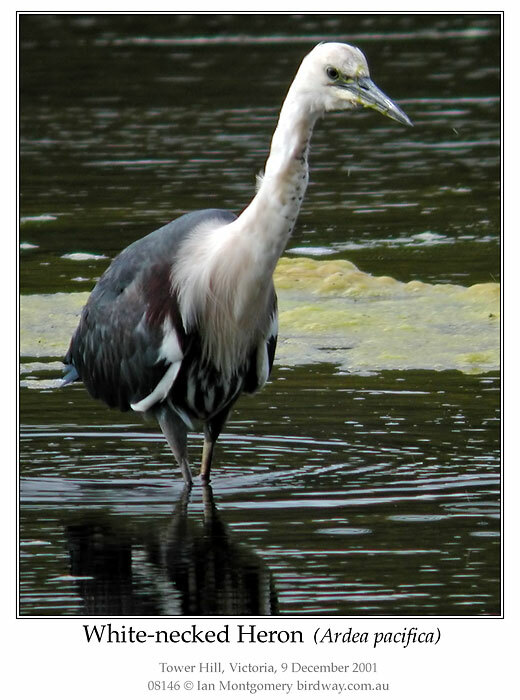 Also, those spots on the non-breeding heron are very noticeable. We don’t have those here in the US of course, since they are native to your area. They sort of look like our Great Egret on the top part and our Great Blue Heron on the body part. What you might consider common, we would consider it a delight to see and the other way around. Our common birds would by your delight to see. 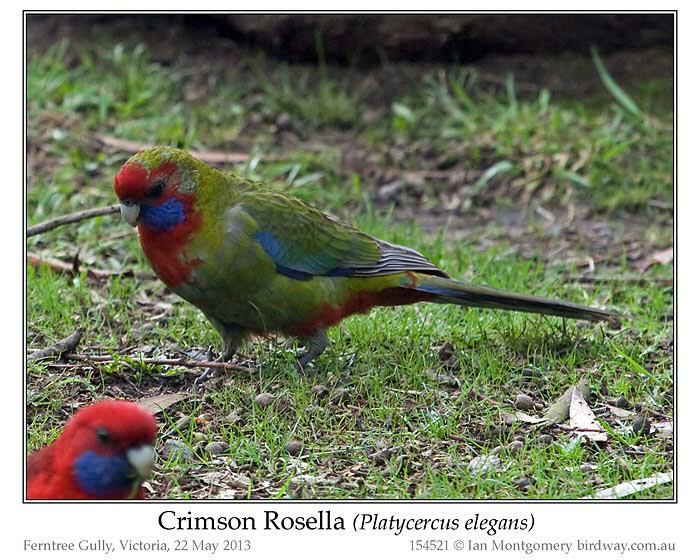 Here is the belated and sought-after bird of the week after a great trip to Victoria. I’ve been unwell since my return a week ago, but things are fine now and the wheels of my life are turning again. Your spiritual support and goodwill have done it again, so it’s another mission accomplished, though in English this time (having been Catalan and Spanish in the past). Actually, most credit should go to my sharp-eared, sharp-eyed, knowledgeable and passionate birding friends. With their hard work, the track record for target species in East Gippsland during our stay was fantastic. We went searching for owls on each of the three nights. The first night, we heard both Greater Sooty and Masked Owls – and the sharpest-eyed of the group saw a Masked Owl in flight. On the second night, at a different site we heard another Sooty Owl and eventually caught sight of it flying among the tall trees of the forest. It then flew over us and perched on a dead limb in the open high above us. I got only this photo, discarding a second out of focus one. For the technically minded, I used manual focussing – it was too distant and the light and contrast too faint for auto focus – and guessed an exposure of 1/80sec at f5.6 and 1600 ISO using the 100-400mm zoom. As the passionate/obsessive birder would understand, it was worth travelling to Victoria for this one photo and, having taken it, misión completa (I have liked it in Spanish since finding the Resplendent Quetzel in Costa Rica in 2010) I was free to relax and enjoy whatever other gems came our way. 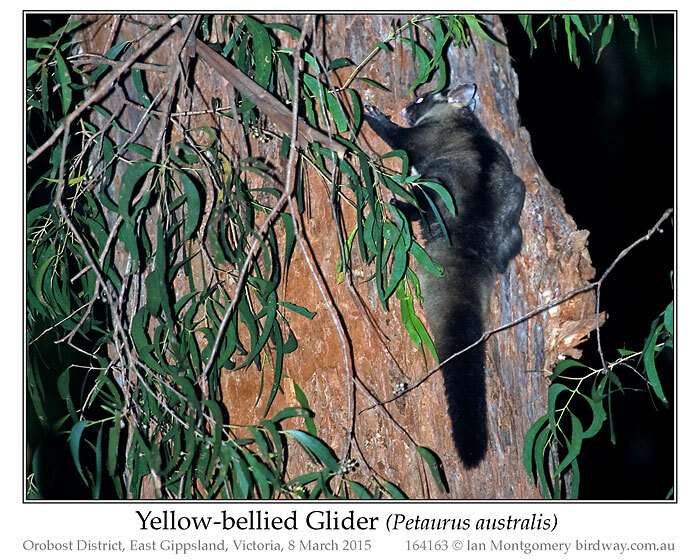 In fact, one such, this Yellow-bellied Glider. sailed over our heads and landed in a nearby tree while we were trying to locate the calling Sooty Owl. These are fantastic, long-tailed, wrist-winged relatives of possums (the Striped Possum of Northeastern Queensland is in the same family, the Petauridae) and the Yellow-bellied can glide up to 150m/400ft. It is rabbit-sized with a huge bushy tail that it presumably uses as a rudder in flight. They’re called wrist-winged, to distinguish them from elbow-winged like the Great Glider, and if you look carefully in the photo you can see the black edge of the membrane attaching to the little finger of the left hand. This proved to be diagnostic as we were unsure of both its identify and of whether the large possum-like animal on the tree was the same creature as the pale form that glided over us. 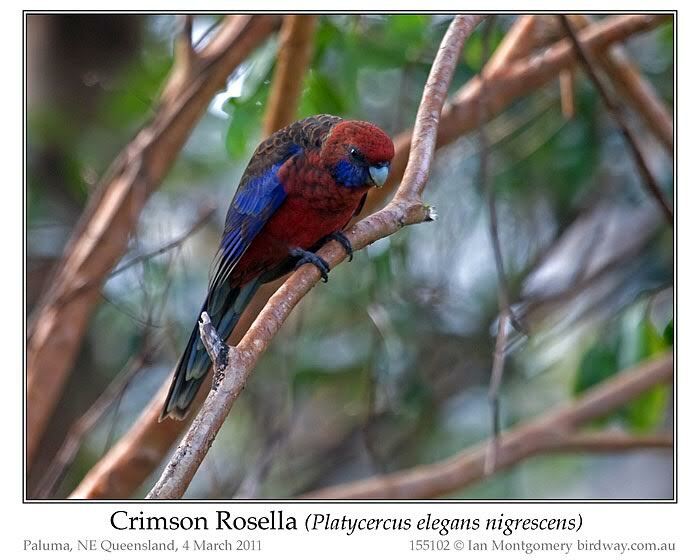 They are reasonably common in suitable old growth forest in eastern Australia, though the northern race regina has a very restricted range in northeastern Queensland and is threatened by logging. Quite coincidentally, I received a request yesterday to support a petition to prevent the transferring of Tumoulin Forest Reserve near Ravenshoe to State Forest so that logging can resume. The petition is aimed directly at protecting the Yellow-bellied Glider, and if you think, like I do, that downgrading the status of nature reserves is disgraceful, then we should support it: http://www.thepetitionsite.com/851/727/614/protect-rare-possum-habitat-from-senseless-logging/. Later that evening, we returned to the Masked Owl site. We could hear one or two Masked Owls but they were wary, keeping their distance in the forest and moving away when spotlights were shone in their direction. We did, however, see one in flight and, having already photographed the Sooty Owl, I was satisfied with that, even though we did try again for photographs without success on the third night. 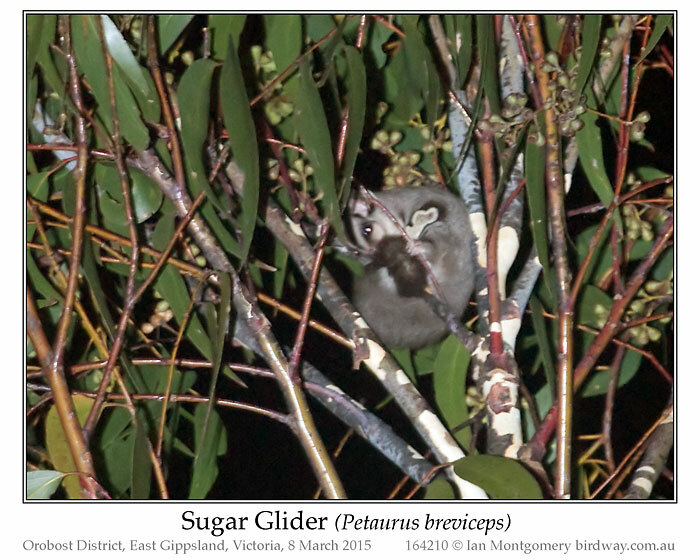 We did, however, find this Sugar Glider, a small relative of the Yellow-bellied. It seemed to be keeping a low profile, very sensible given the presence of calling owls. Later still, we came across a juvenile Southern Boobook which flew up in front of us into a small tree beside the road. It didn’t dally for a photo, but that made it a three-owl evening which we all thought was special. I’ve barely mentioned Sooty Owls, as so much else happened that evening. 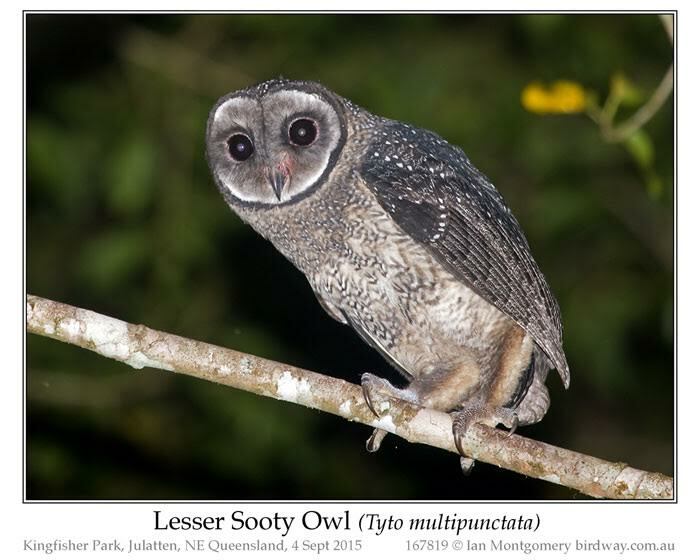 There are two Australian forms: the Lesser Sooty in the wet tropics of northeastern Queensland and the Greater Sooty in eastern Australia from Eungella National Park near Mackay in Queensland to the Dandenong and Strzelecki Ranges in Victoria, both reasonably common in suitable habitat of wet, gully, forest but rarely seen. Another race, supposedly of the Greater Sooty, occurs throughout New Guinea. Currently the Lesser and Greater are treated as separate species by most authorities, though Christidis and Boles lumped them in 2008. Having one species with a disjoint range in New Guinea and eastern Australia and a closely-related separate one in between should make any student of biogeography laugh out loud, but that’s the way it is. Sooty Owls feed mainly on arboreal mammals, though they will take other prey such as birds. On the following day we returned to the Sooty Owl site and here is a photograph of me photographing it, the red spot showing where the bird in the photo was perched. I was surprised at how far up it was and felt very fortunate to have got the one reasonable photo. This forest also produced for us Tawny Frogmouth, Australian Owlet-Nightjar, Brush-tailed Possums, a bandicoot, a wombat and Black or Swamp Wallabies leaving us in no doubt about the value of old growth forests (reminder http://www.thepetitionsite.com/851/727/614/protect-rare-possum-habitat-from-senseless-logging/). A few people have requested location information about the owls, but I have been sworn to secrecy by my friends as they don’t want them being disturbed too much or subjected to tapes of owl calls. So please understand my reticence. What an adventure. Some birds just don’t want to be found. Thanks again, Ian, for sharing another trip with us. Glad you are feeling better. 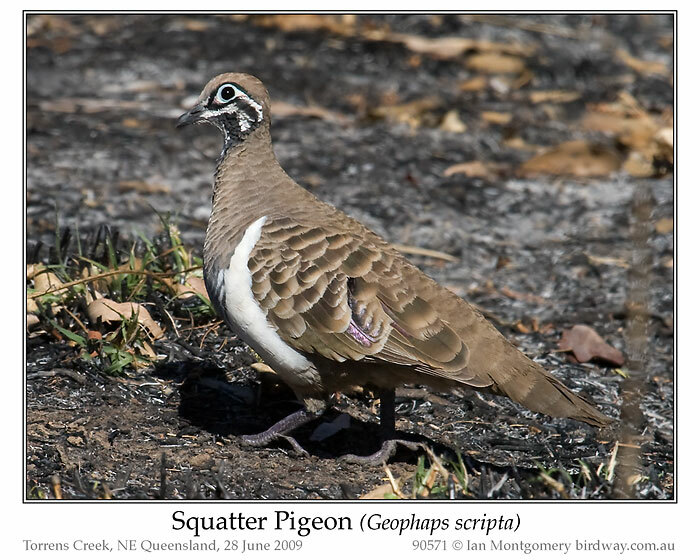 The series of raptors from Europe is perhaps a hard act to follow, so here is something quite different from much closer to (my) home: the Squatter Pigeon,an attractive ground pigeon not uncommon in the drier areas of northern Queensland. Its range used to extend to northern New South Wales, but it is very rare or extinct there and has declined in southern areas of Queensland. The reasons for its decline are not clear but is thought to be due to grazing pressure and perhaps predation by foxes and feral cats. 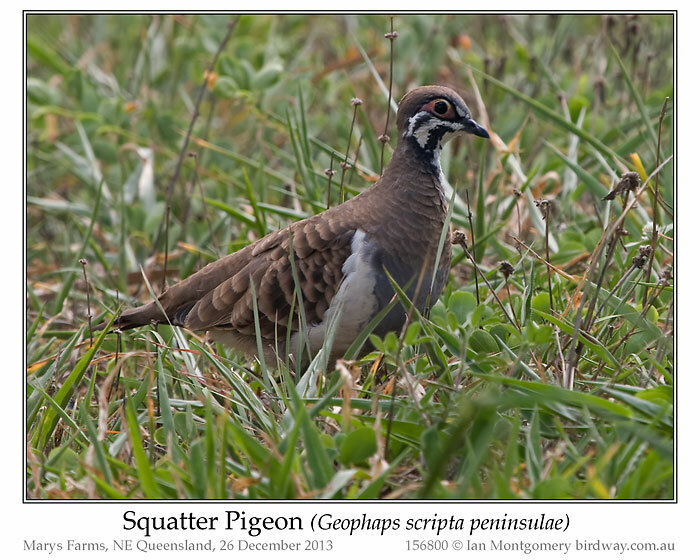 Toonpan, a short drive south of Townsville on the Flinders Highway is a good spot for this species. When Ross River Dam was built, part of the highway between Toonpan and Townsville was flooded and a new highway was built on higher ground. The old highway still exists and is a quiet roadway through grassland, popular with birders. 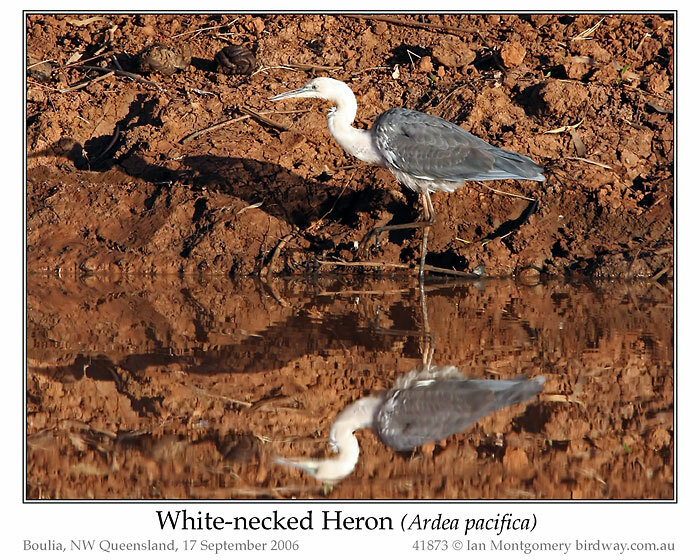 The habitat in the second photo – taken from the ebook Where to Find Birds in North Queensland – may look uninspiring, but can be very productive often producing other such specialties such as Australian Bustard, various finches including Black-throated and, in winter on powerlines, Red-backed Kingfishers. It’s not clear where the name Squatter Pigeon came from, presumably either from its habit of crouching and freezing when disturbed or because of its association with the cattle stations, the original occupants of which were called squatters. It was originally named by the Dutch zoologist Temminck in 1821 and he seemed very taken with it. Like Bonelli in the previous Bird of the Week, he published in French, calling it the Colombe marquetée and describing how each patch of white on the face was framed with black, producing an effect like ‘a sort of marquetry. He gave it the scientific name Geophaps scripta, meaning ‘ground pigeon with writing’, ‘phaps’ being the Greek for pigeon. Temminck, incidentally, named many species of animals and various others were named in his honour, such a Temminck’s Stint. Sometimes you can see the iridescent feathers on the wing, third photo, a display feature shared with other ground pigeons notably the Bronzewings These feathers are usually hidden in Squatter Pigeons except in display and flight. The body shape is broken up by the white stripe between the breast and the wings, and the black and white facial markings disguise the head and make the eye less conspicuous. Squatter Pigeons nest in a scrape on the ground, so camouflage is important and it is easy to appreciate that a motionless bird crouching on the ground would be quite hard to spot. If you look carefully at both bare facial skin of both the Toonpan bird and the one in the third photo taken much farther west along the Flinders Highway, you’ll see the the skin is mainly pale blue around the eye with some pink at the edges in front and behind the eye. 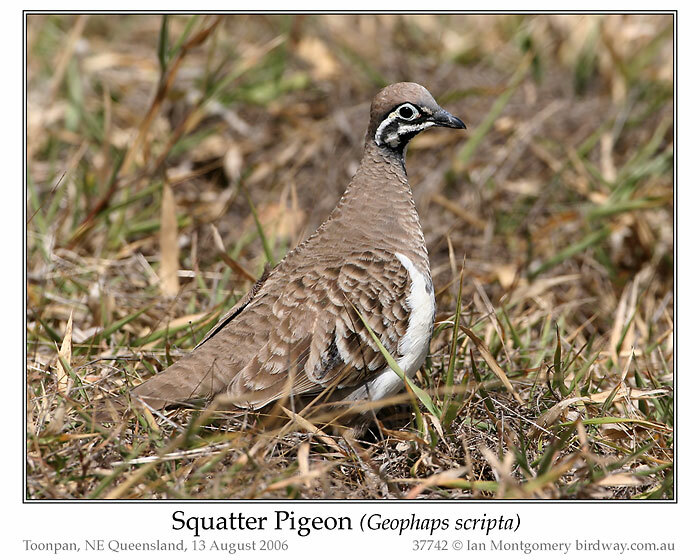 Two races of Squatter Pigeon have been described, with the nominate southern race having completely blue facial skin – fourth photo near Carnarvon Gorge – and a Cape York race peninsulae having reddish facial skin. The two races are not geographically well-defined and there is a broad band of intergradation with mixed blue and pink in the Townsville area. Photos five and six show examples of the Cape York race. 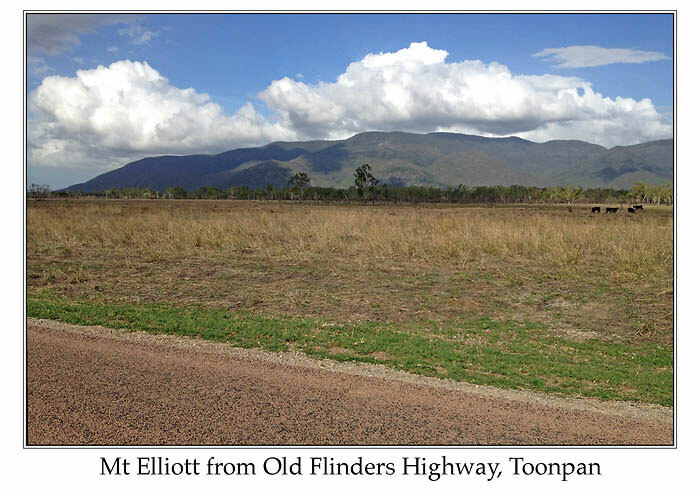 Both Marys Farms and the Mitchell River catchment are in the Mount Carbine district south of Cape York proper. The bird in the last photo is perched fairly high in a tree, just to prove that it will sometimes take refuge in trees. It is the blue-faced southern race that has declined most and is regarded as ‘vulnerable’. The Cape York race and the hybrids in the Townsville district are still reasonably common. The Partridge Pigeon, G. smithii, replaces it in northwestern Australia. It also has races with different coloured faces, red in the Top End of the Northern Territory and yellow in the Kimberley district of northern Western Australia. It has also declined. 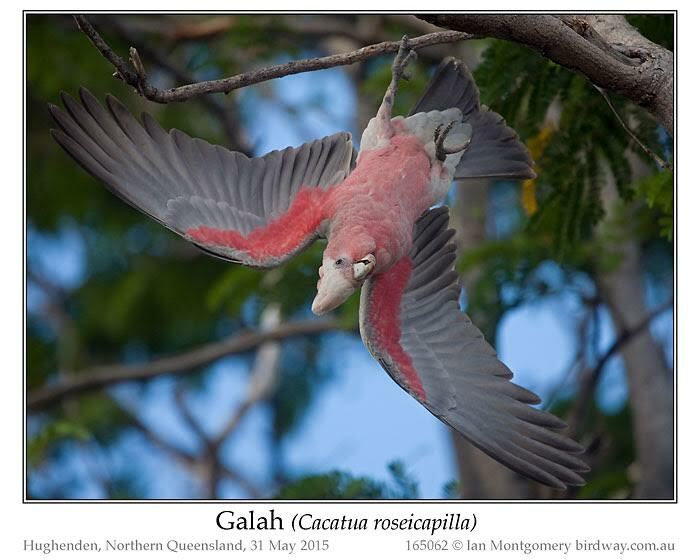 Although I have seen it in Kakadu National Park I haven’t yet photographed it. I like the markings on their faces. They are interesting, yet, it doesn’t keep them from being camouflaged. “The Squatter Pigeon (southern) is a medium-sized, ground-dwelling pigeon that measures approximately 30 cm in length and weighs about 190-250 g. The adults are predominantly grey-brown, but have black and white stripes on the face and throat, blue-grey skin around the eyes, dark-brown (and some patches of iridescent green or violet) on the upper surfaces of the wings, blue-grey on the lower breast and belly, white on the lower region, flanks of the belly and extending onto the under surfaces of the wings, and a blackish-brown band along the trailing edge of the tail. They have black bills, dark-brown irises, and dull-purple legs and feet. The sexes are similar in appearance (Higgins & Davies 1996). 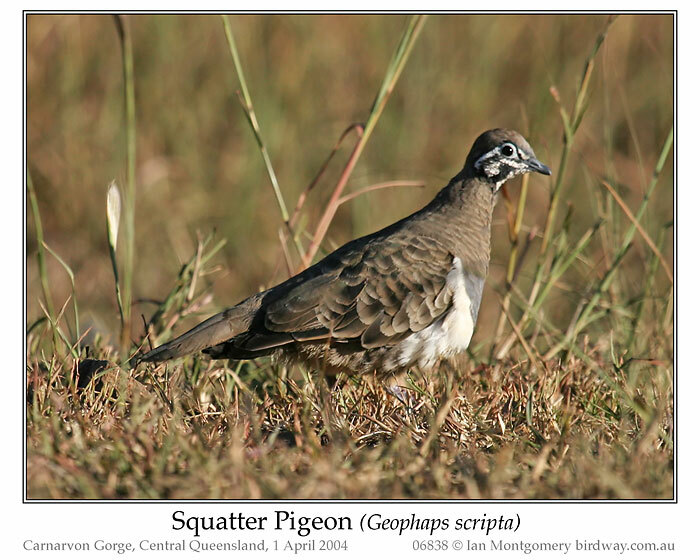 Juvenile Squatter Pigeons (southern) can be distinguished from the adults by their duller colouring, the patchy, less distinctive appearance of their black and white facial stripes, and the paler colouring (buff to pale-yellow) of the facial skin (Higgins & Davies 1996). This week’s good news is that the ebook Where to Find Birds in Northern Queensland is now available on the iTunes store (in 51 countries). So if you have an iPhone, iPad, iPod Touch or Mac (running OS X Maverick) this is for you! Here is the link: https://itunes.apple.com/au/book/where-to-find-birds-in-northern/id912789825?mt=11&uo=4. 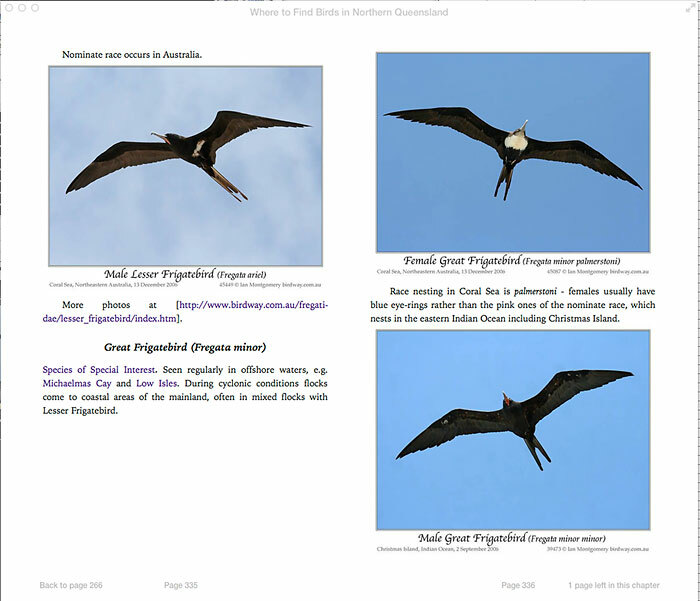 To make a connection with this week’s bird, the Great Frigatebird, here is a screen shot from iBooks to show you what you can expect. All the text items highlighted in purple and links to either other places in the book – typically places, birds or lists – or external websites. The images are the same size as the ones that are included in the bird of the week, so if you double-click, or double-tap, on them, you can enlarge them to full size. If you think about birds in northern Queensland, perhaps iconic rainforest species like the Cassowary or Victoria’s Riflebird come to mind. Fair enough, but there is much more to this region than rainforest, important though that is.The area also has wonderful wetlands, tropical savannah forest, mountain ranges, dry country habitats and, last but not least, the coast with its Barrier Reef, beaches, mangroves, mudflats, continental islands and coral cays. So it should be no surprise that over 400 species of birds occur here and you need a reference devoted to the region to do it justice. I’ve chosen a dramatic seabird to make the point. The term ‘frigate’ was first applied in the 17th century to warships built for speed and manoeuvrability and frigates were often used by pirates to attach merchant shipping. 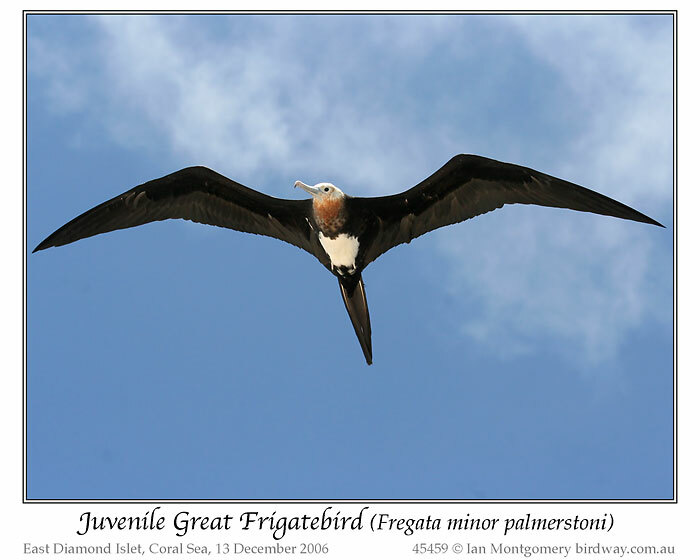 Frigatebirds, also called Man o’ War Birds, got their name for their piratical habitats of harrying other seabirds like boobies and tropicbirds to make them drop their prey. In fact, studies have shown that piracy accounts for perhaps only 20% of their food, and they are expert fishers as well. They fish by snatching prey, such as squid and young turtles, from the surface of the sea or in flight, in the case of their favourite prey, flying fish. Despite their naval name, frigatebirds are wonderfully adapted for flying and are poor swimmers to the extent that they are reluctant to land on water, as they can take off only in strong winds and their plumage is not waterproof. They have very light bones making up only 5% of the body, huge pectoral muscles, enormous wing area, long forked tails for rudders and streamlined bodies with small heads. 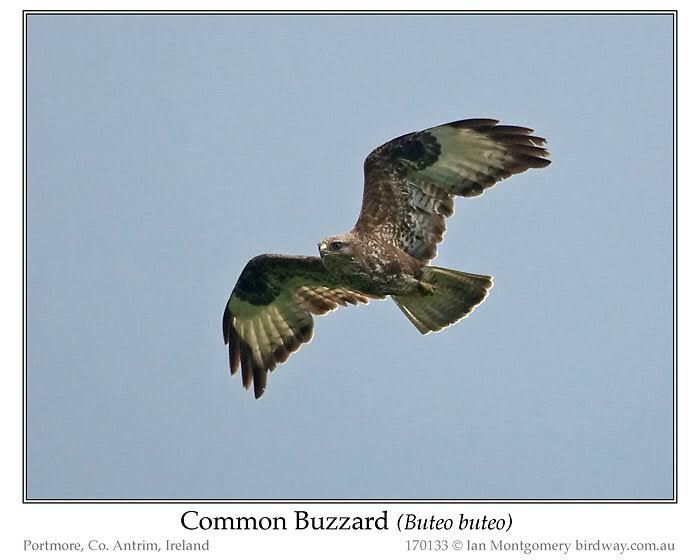 Despite their size, they are very light, soar effortlessly in good winds and are very acrobatic. 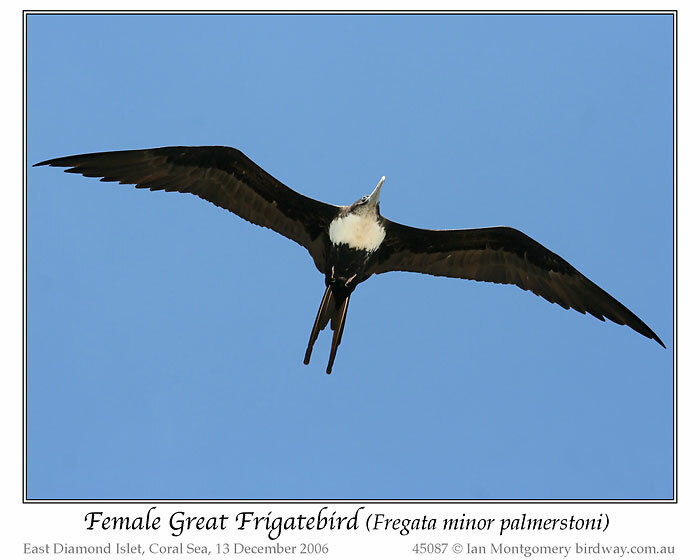 Female Great Frigatebirds, larger than males, are about 1m/40in long, have a wingspan to 2.3m/90in but weight only 1.2-1.6kg/2.6-3.5lb. 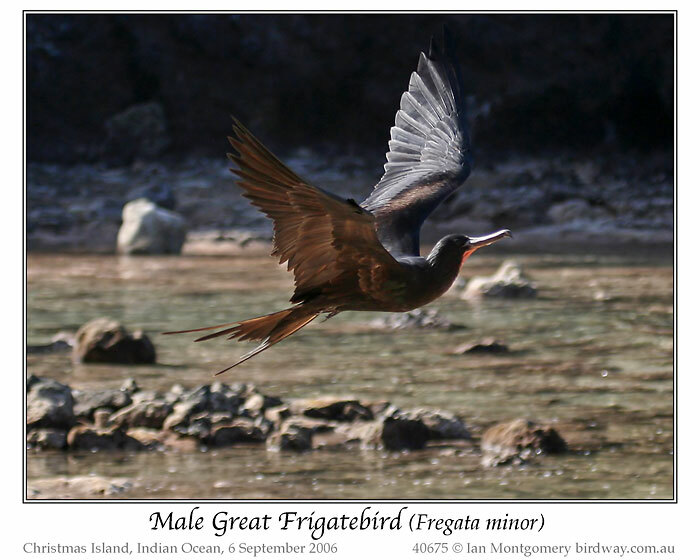 The male Great Frigatebird, first photo, is the only all-black frigatebird occurring in Australia – the other all-black males are the Magnificent Frigatebird of Atlantic Ocean and the eastern Pacific and the Ascencion Frigatebird of the east Atlantic. Frigatebirds are unusual among seabirds in drinking freshwater if they can get it, and this male is drinking at the mouth of freshwater stream on Christmas island by snatching a beak-full of water in flight. Frigatebirds also bathe in flight by splashing into the surface of the water and flying off. You can also see its red gular pouch. This is inflated to enormous size to impress females during courtship. I haven’t got a photo of displaying Great Frigatebird, but you can see a Magnificent Frigatebird doing so here: Magnificent_Frigatebird. 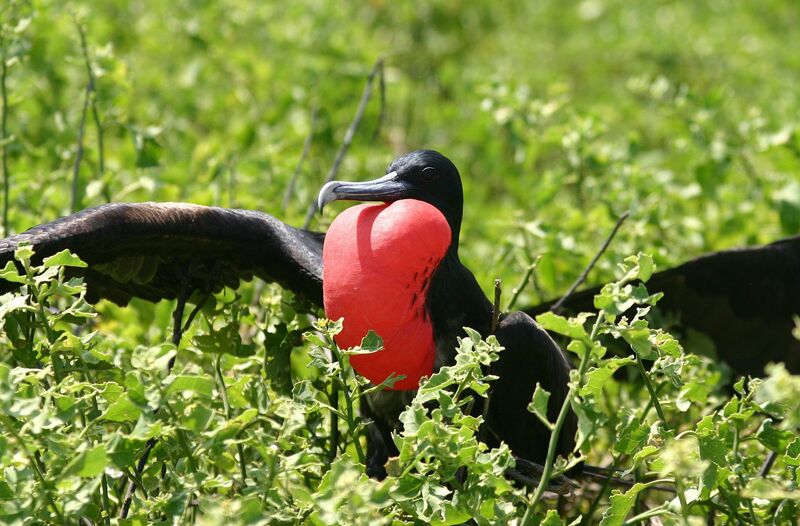 Female Great Frigatebirds have white breasts and care needs to be taken in distinguishing them from other female and juvenile frigatebirds – Lesser Frigatebirds of both sexes have white ‘spurs’ in the axil of the underwing, and Christmas Island Frigatebirds of both sexes, have white bellies. 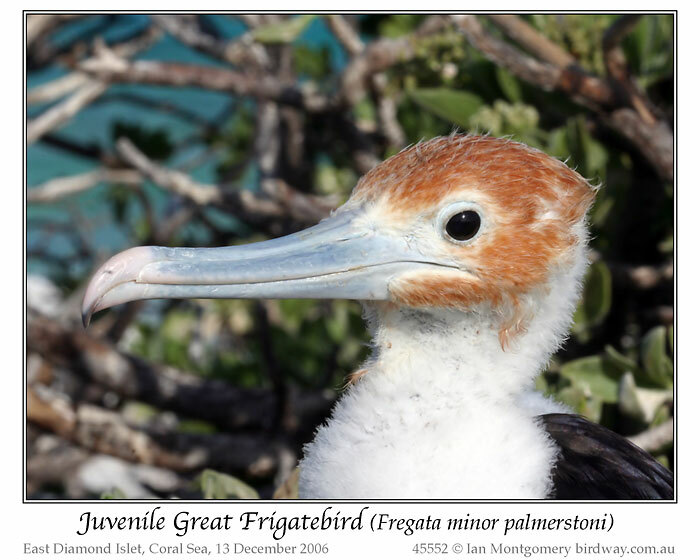 Birds in Indian Ocean waters in Australia belong to the nominate race minor, distinguished by the females having pink eye-rings, second photo. Birds in the Pacific belong to palmerstoni and usually have blue eye-rings, third photo, though doubt exists as to the validity of the races and the reliability of the fieldmarks. Because of their need for consistent winds, frigatebirds are restricted to tropical waters where they can rely on the trade winds. Adults are sedentary and remain close to their roosting sites and breeding colonies, mostly on small isolated islands. Non-breeding birds and immature birds are pelagic and move over huge distances. Trade winds are unusual in that they form cumulus clouds and hence thermals over water both by day and night, and frigatebirds make great use of these to soar as high as the cloud base and will fly at night if conditions are right. Pelagic frigatebirds use the front of storms to move around and can cope with high winds very well. This is why they appear in coastal areas after cyclones and are supposed to be called ‘rain-brothers’ by Australian aborigines, though I haven’t been able to verify this. 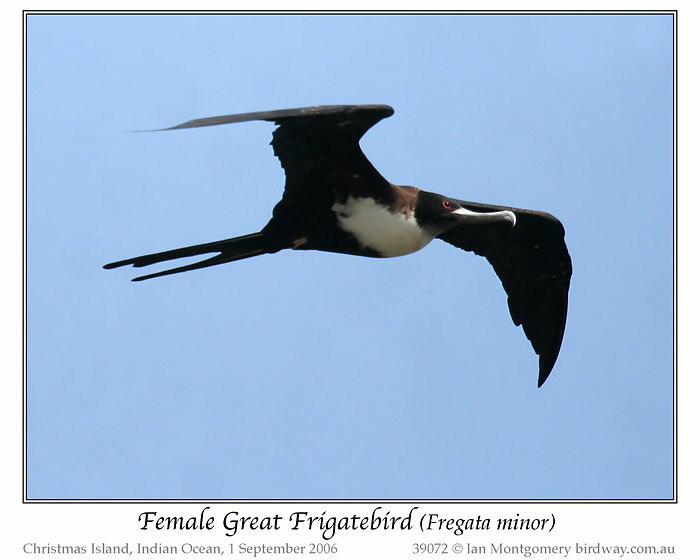 The range of the Great Frigatebird includes the tropical Pacific, southern tropical Indian and western Atlantic Oceans. In Australia it breeds colonially on islands along the outer Great Barrier Reef, in the Coral Sea and on Christmas and Cocos (Keeling) Islands in the Indian Ocean, usually in mangroves. The juvenile in photos five and six was photographed on East Diamond Islet, about 600km east of Cairns http://www.satelliteviews.net/cgi-bin/w.cgi?c=cr&UF=34304&UN=456541&DG=ISL. Breeding birds form pair bonds and both parents share in the incubation and feeding of the young. The young develop very slowly. This is thought to adapt them to periods of starvation when the adults have trouble finding food, and remain under parental care for many months. 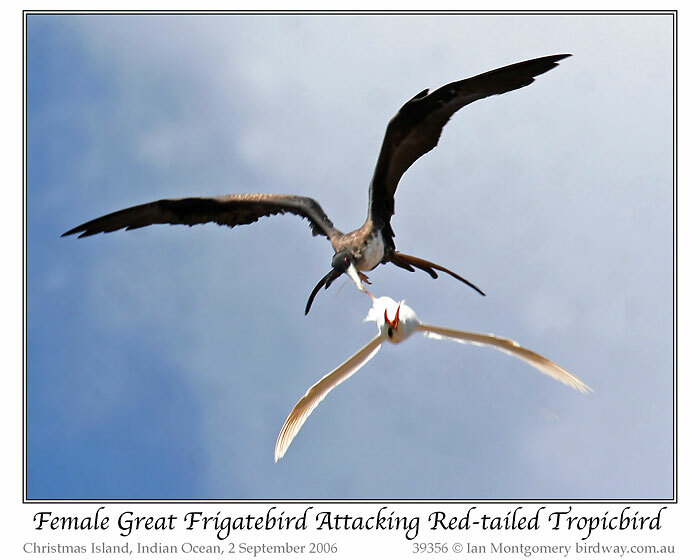 The last photo shows a hapless Red-tailed Tropicbird near Christmas Island being harried by a female Great Frigatebird who has grabbed it by the tail-streamers. Frigatebirds hang out near seabird colonies waiting for birds carrying prey or with full crops returning to feed their young. It’s hard enough work being a parent without having to put up with this! Thanks again, Ian, for introducing us to another interesting bird. We have seen the Magnificent Frigatebirds here in Florida, but these Great ones are also amazing. That fact about only 5% of their weight being the bone structure is another fantastic design from their Creator. 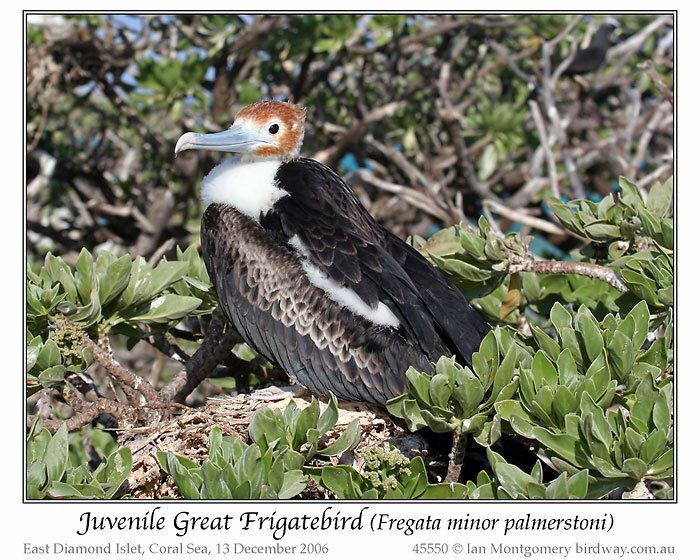 Frigatebirds belong to the Fregatidae – Frigatebirds Family which only has five species in it.